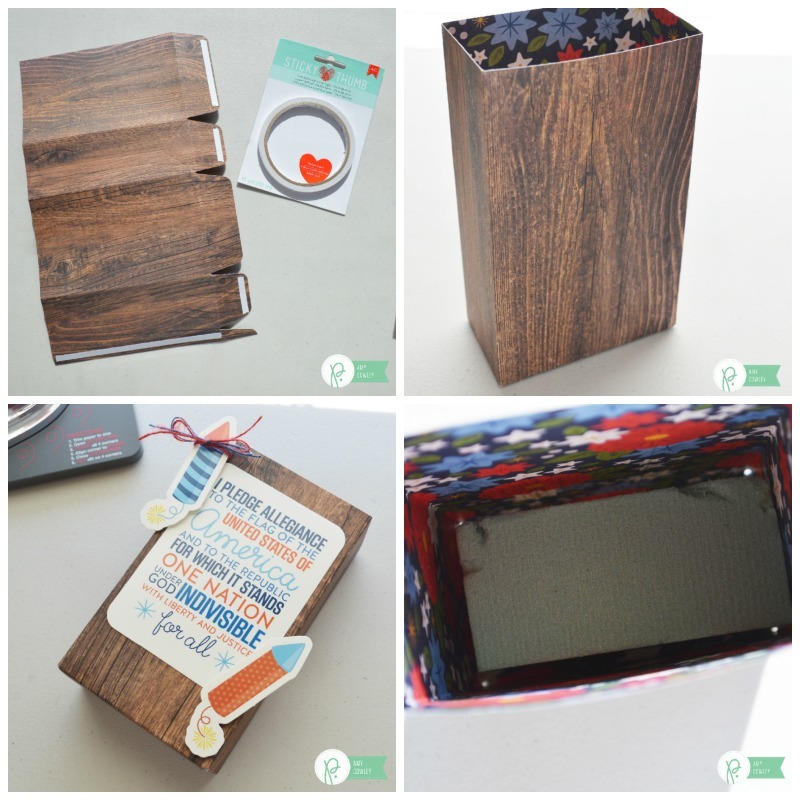 Amy Cowley Archives - Pebbles, Inc.
Hey there, it’s Amy from The Happy Scraps here today. 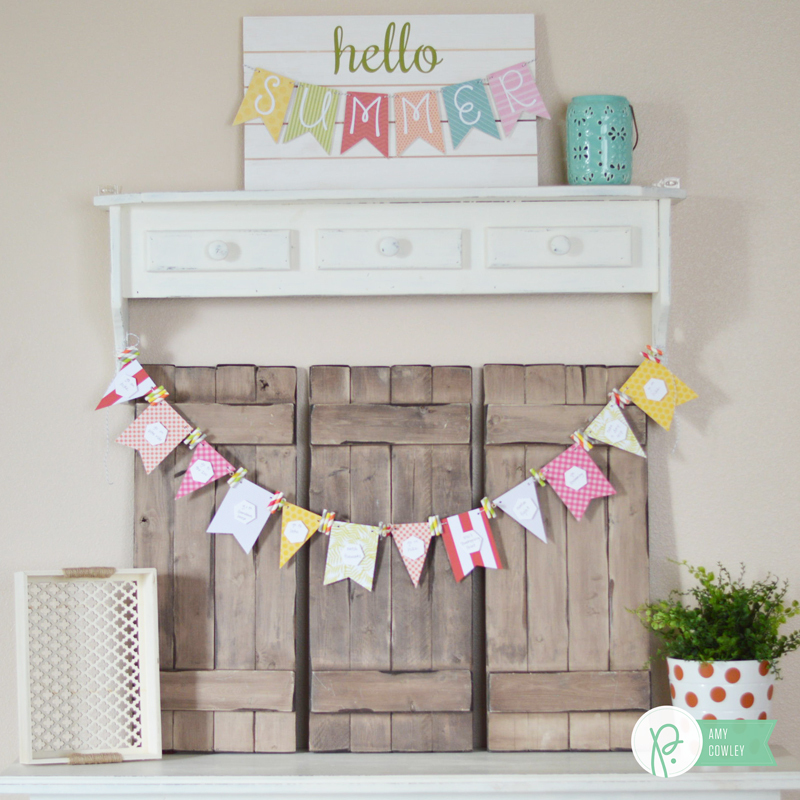 Do you love summer time? I do, and I love getting outdoors and spending time with my family. One of our favorite things to do is head out on a picnic. Summer was made for picnics, wasn’t it? 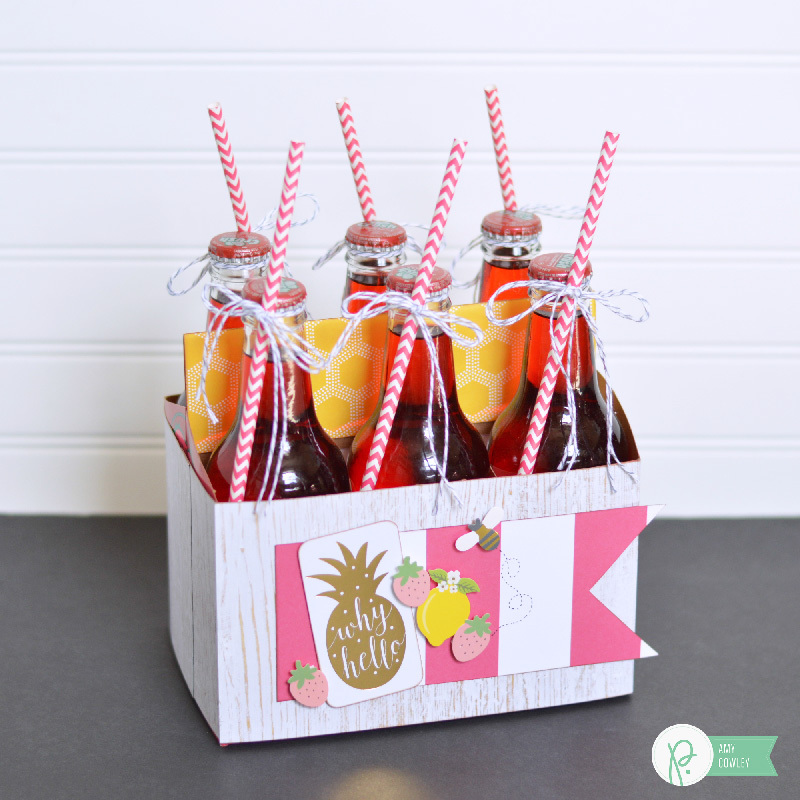 I decided I wanted to dress up some drinks for us to take on a picnic, but this would be a fun little gift to give to a friend or take with you when getting together with friends for a BBQ or picnic as well. 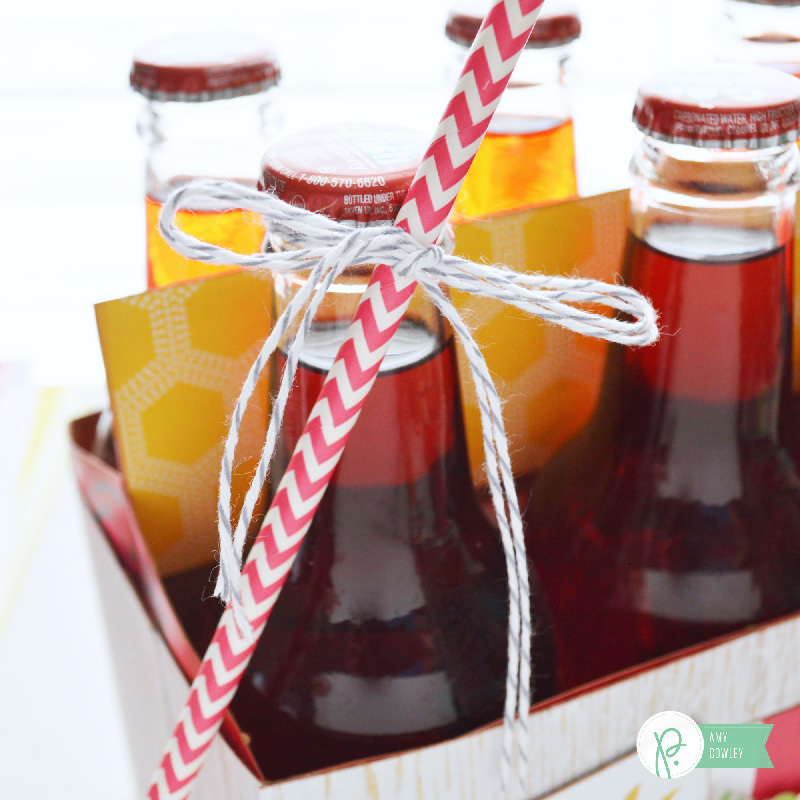 Come along and I’ll show you how I put this Summer Picnic Quick Gift together. 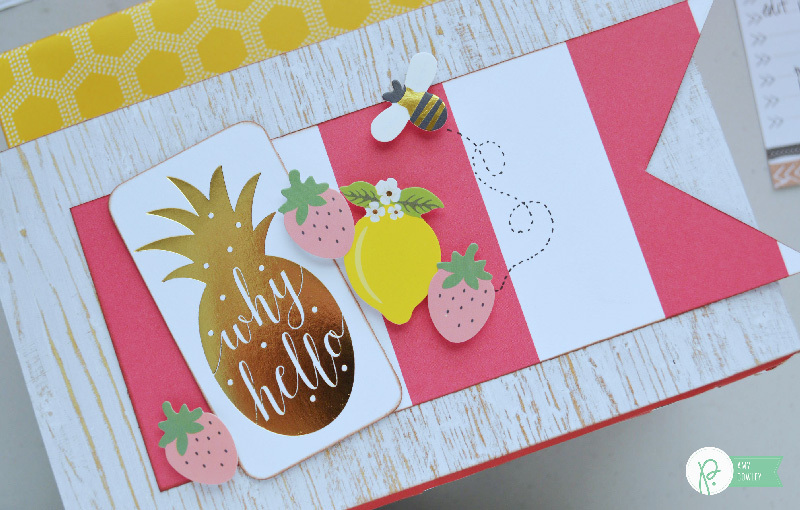 I picked out some fun supplies from the Jen Hadfield Everyday Collection as well as some stickers from the Spring Fling Collection. 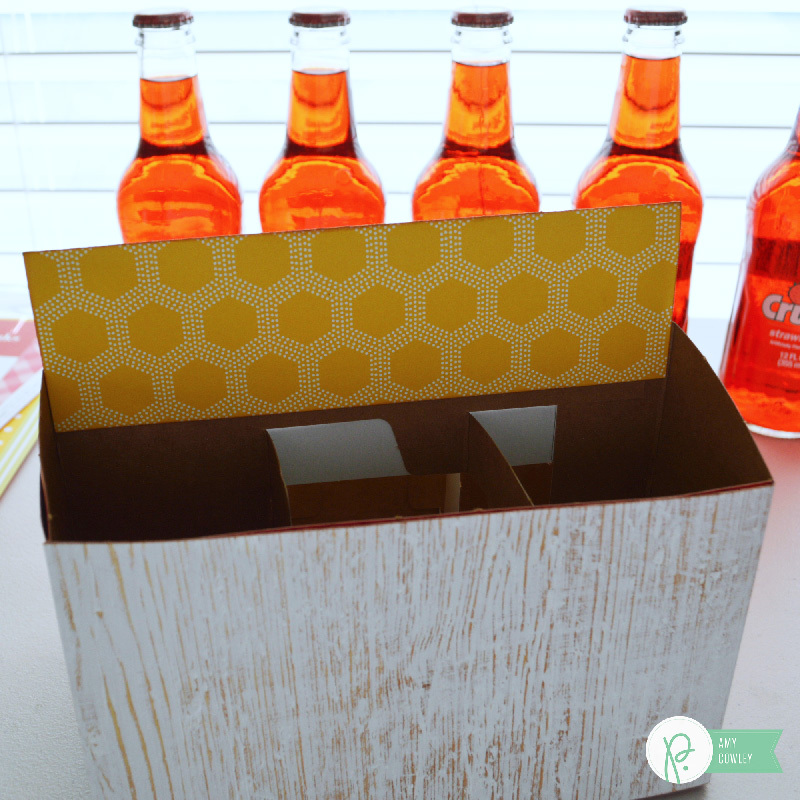 Using the Everyday Pops of Color paper, I cut it to size, inked the edges and wrapped it around the soda crate box. I measured the top handle part of the crate, doubled it so I could fold it over the top, and cut some Everyday Honeycomb to the size I needed for it. Then I inked the edges. I attached it to the top of the box. 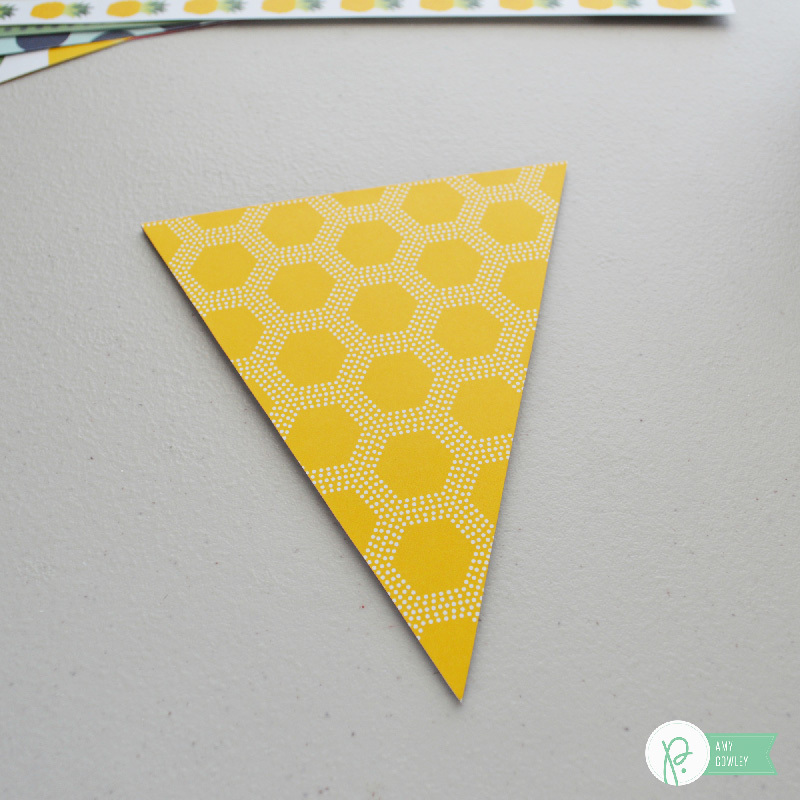 I cut a piece of Everyday Trellis paper and cut a triangle out of the end of it, creating a flag like shape. Once cut, I inked the edges of it as well. I got the other embellishments ready. 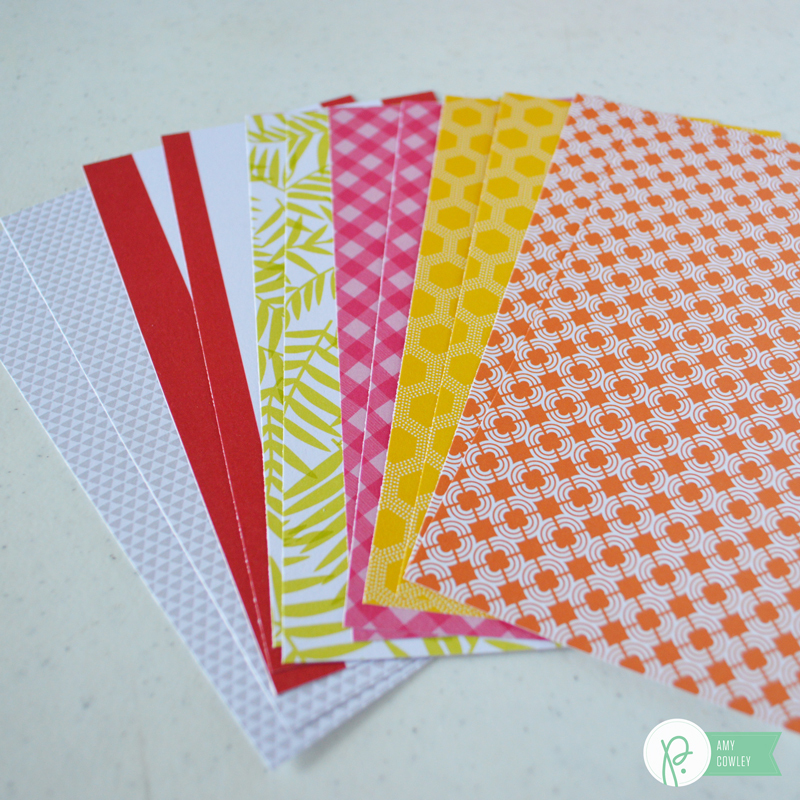 I pulled some stickers from the Everyday Cardstock Stickers and Spring Fling Foiled Cardstock Stickers. For the stickers, I used the baby powder trick on. 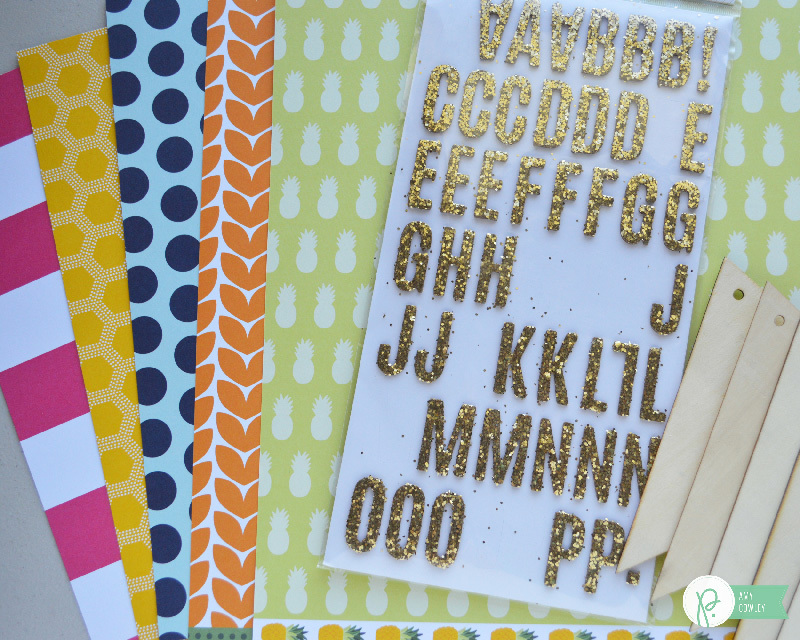 I also used a card from the Everyday Foiled Cardstock Cutouts w/ Gold paper and trimmed it down to the size I wanted. I inked the edges of the card. 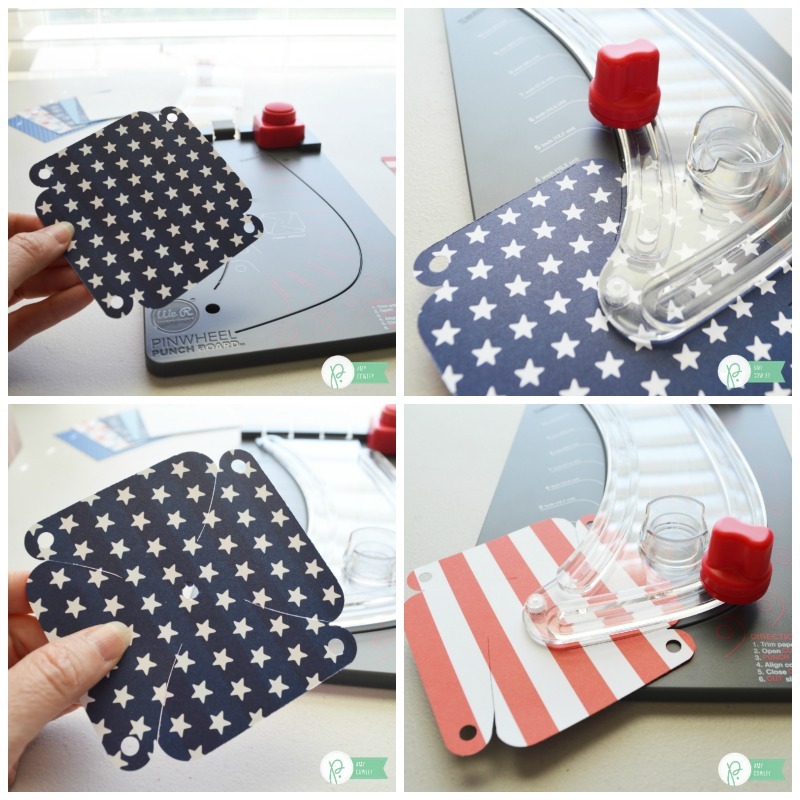 I mounted the flag shape onto the box, then started mounting the embellishments. I used 3-dimensional foam tabs to create some dimension. Once I had everything mounted onto the box, I had fun drawing the dashed line from the bee to the strawberry. 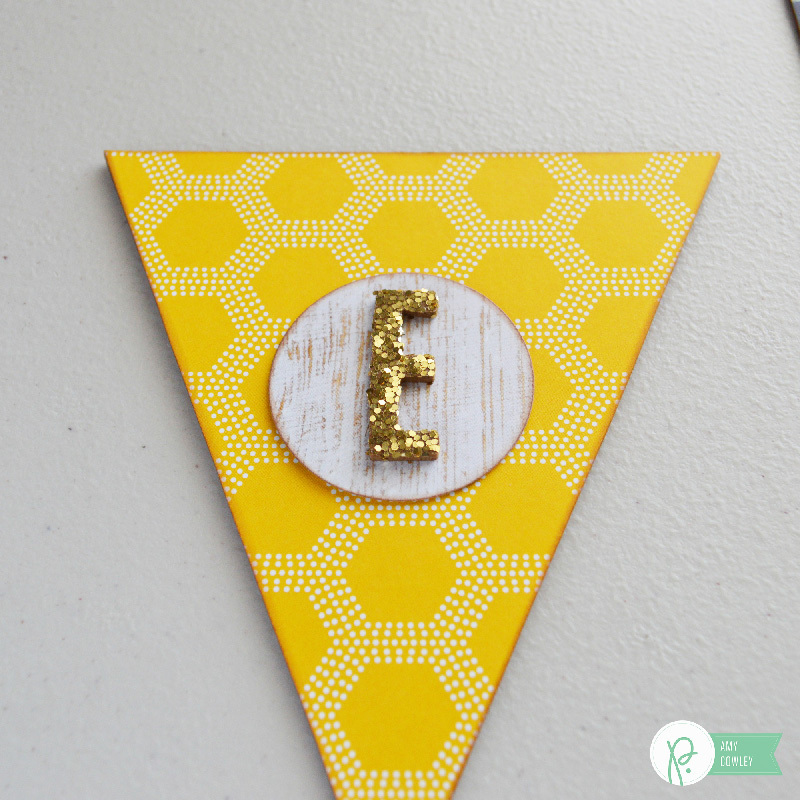 I thought it was a fun little addition to the project! 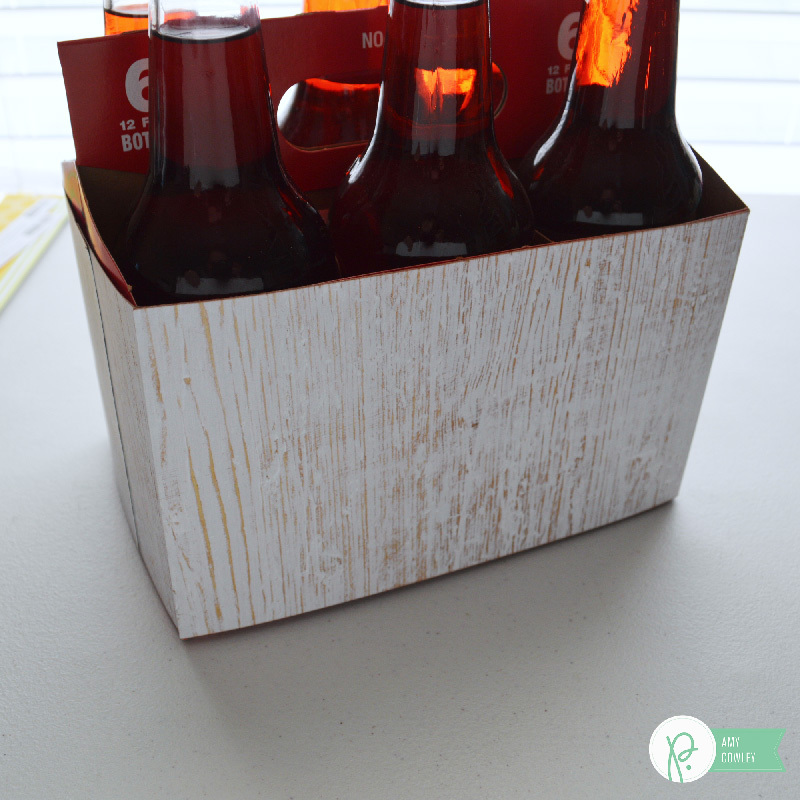 I finished it all off by adding a straw to each bottle of soda. I tied it on with some baker’s twine. Now I’m all ready to grab it and head out on a picnic! Who’s coming with me?! 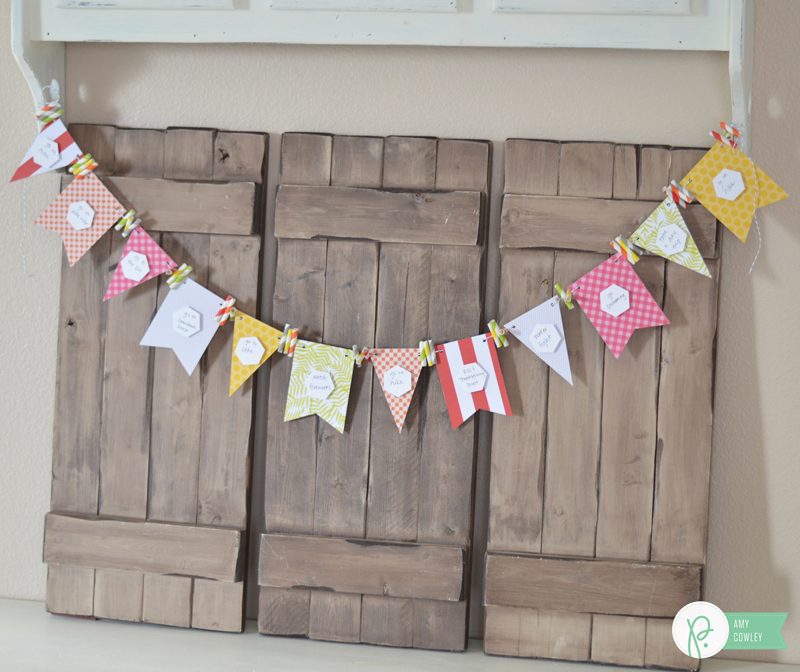 Aren’t the embellishments on the front so cute? 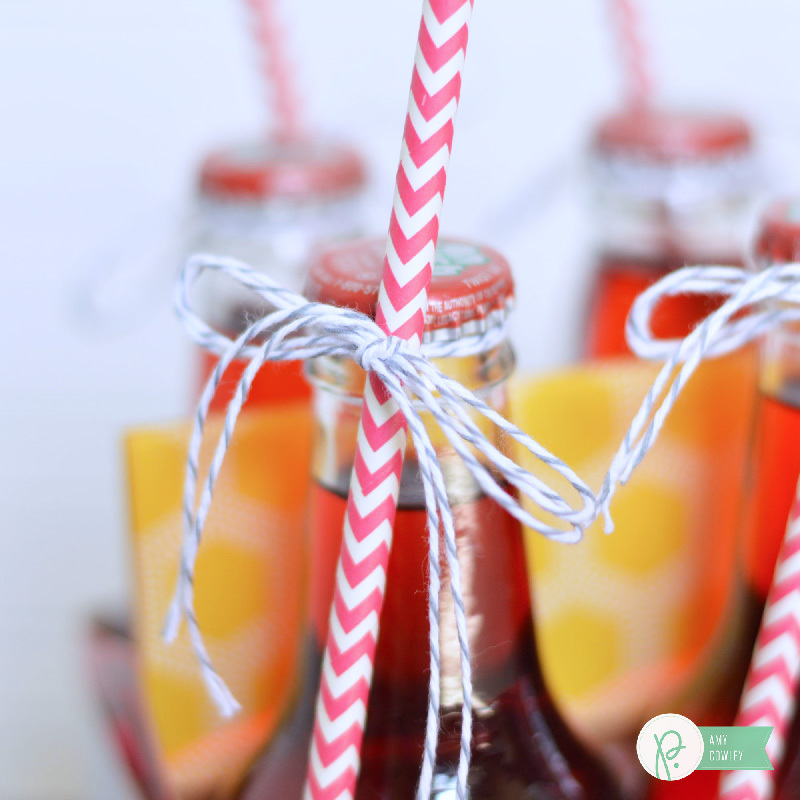 And the straws, it just wouldn’t be complete without them. 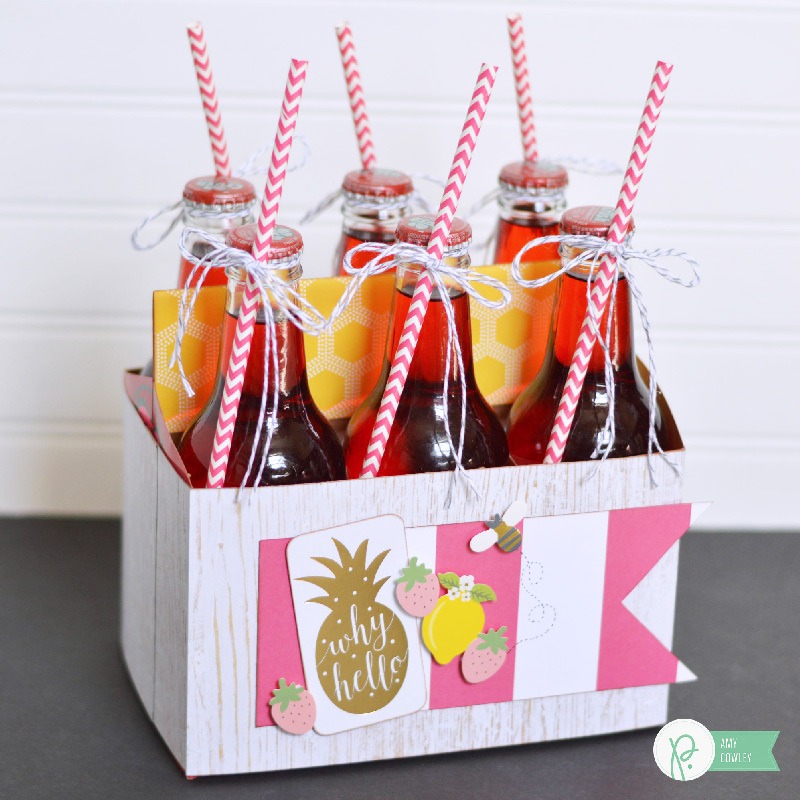 Whip up one of these cute little Summer Picnic Quick Gifts for your next little get together. It’ll be so fun! Hello there! 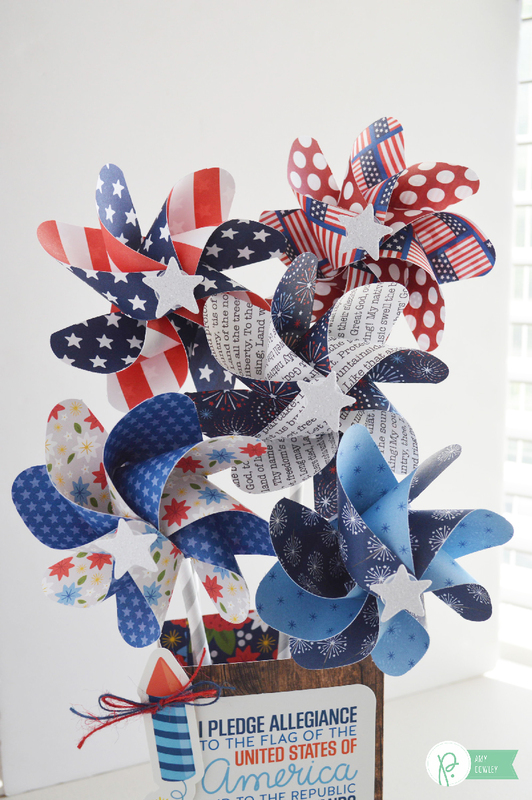 Amy from The Happy Scraps here today and I’m excited to be sharing my newest Red, White & Blue Pinwheel Decor piece with you today. 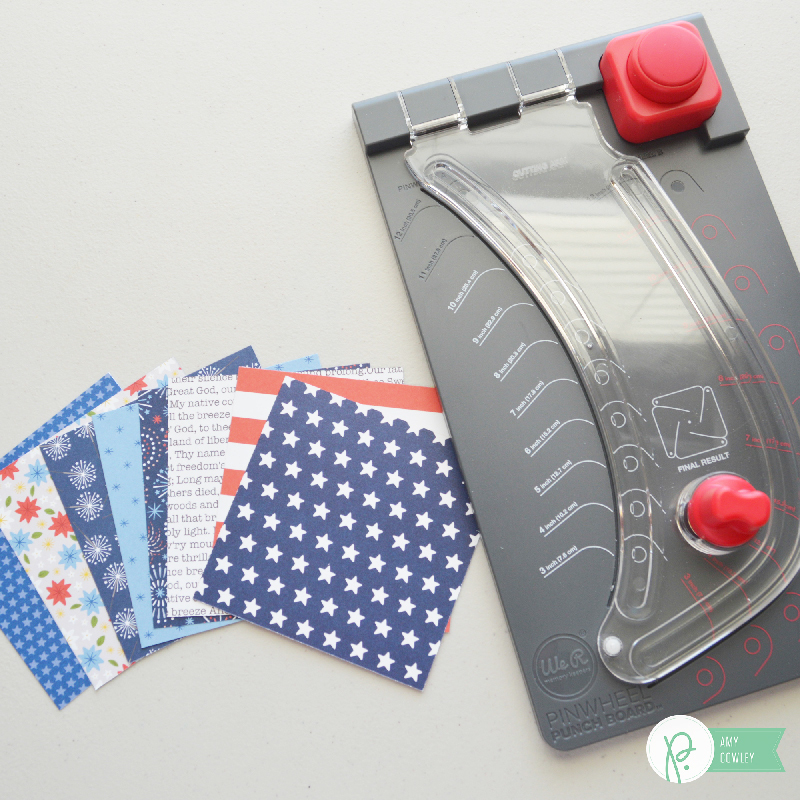 I love to decorate for Independence Day and the new America the Beautiful collection is perfect for it. 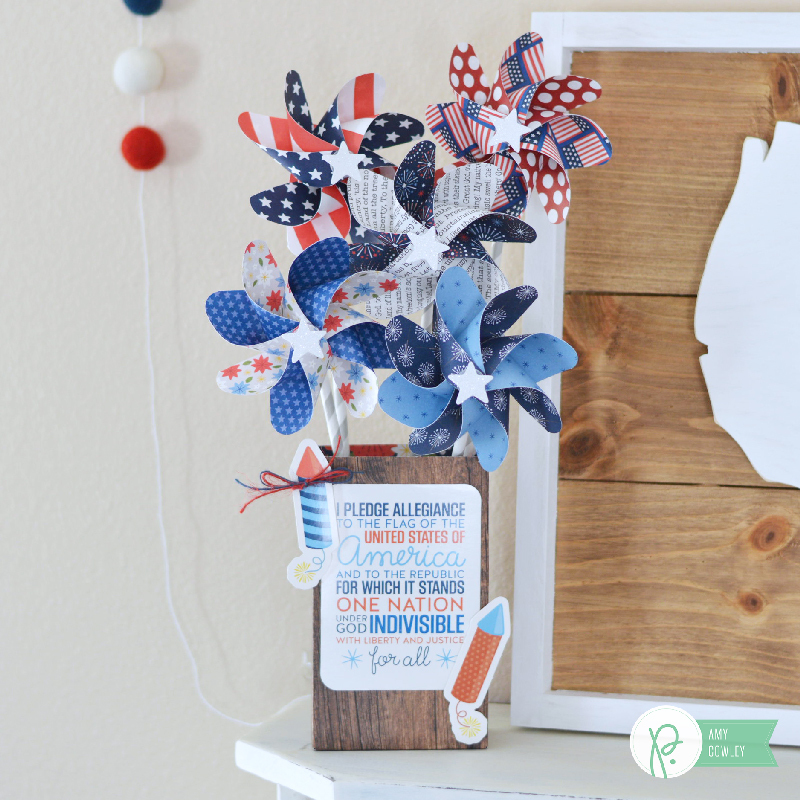 To start off, I grabbed the Patriotic Posies Paper and used the gift bag punch board to make a little bag for my pinwheels. 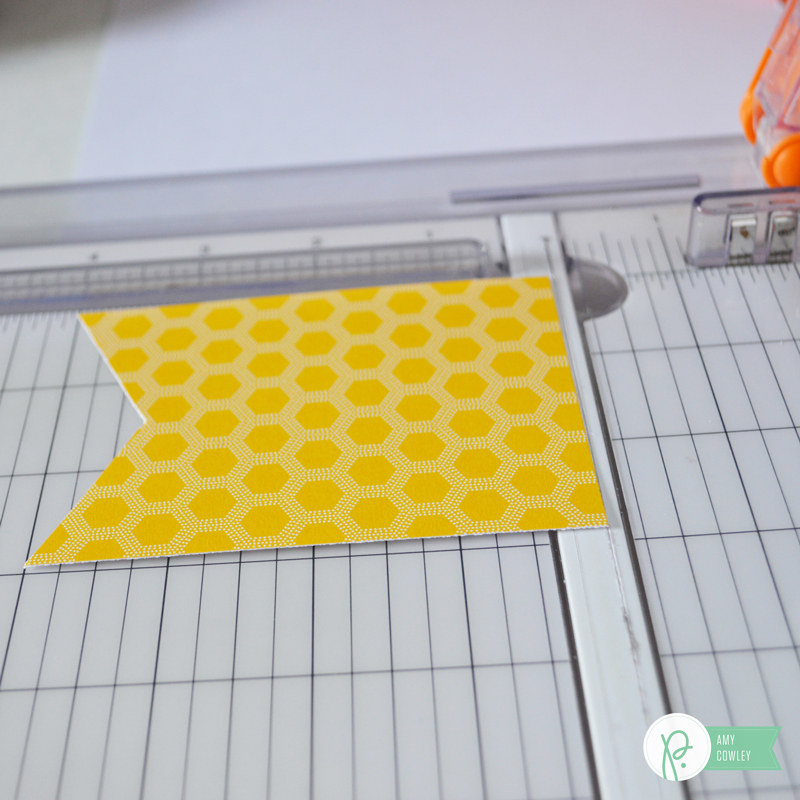 I cut my paper to be 7″ x 12″ and followed the instruction on the gift bag punch board to make my bag. 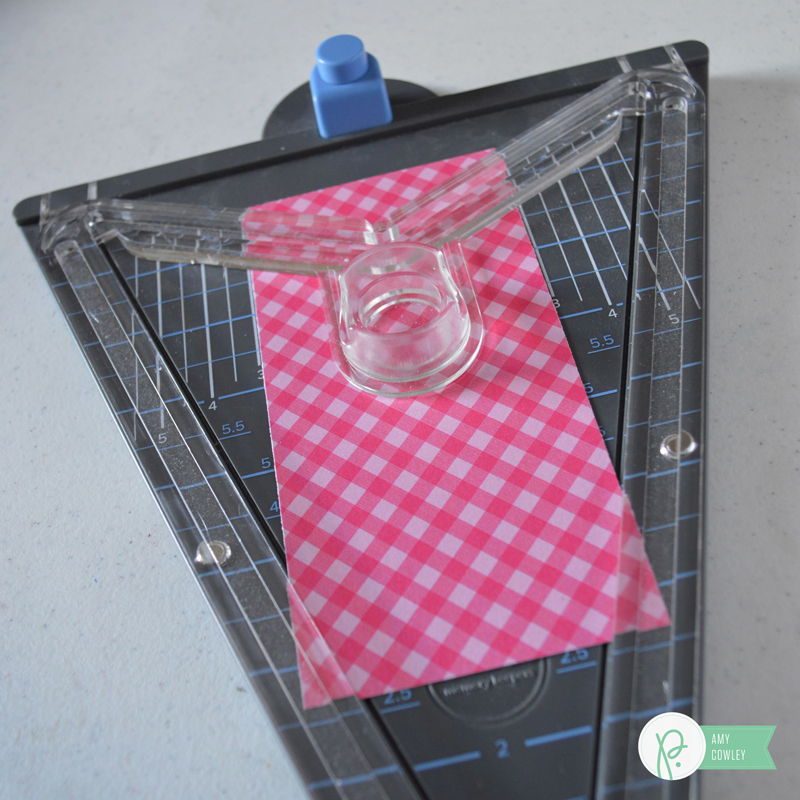 I used the Sticky Thumb Two-Sided adhesive tape to put my bag together. 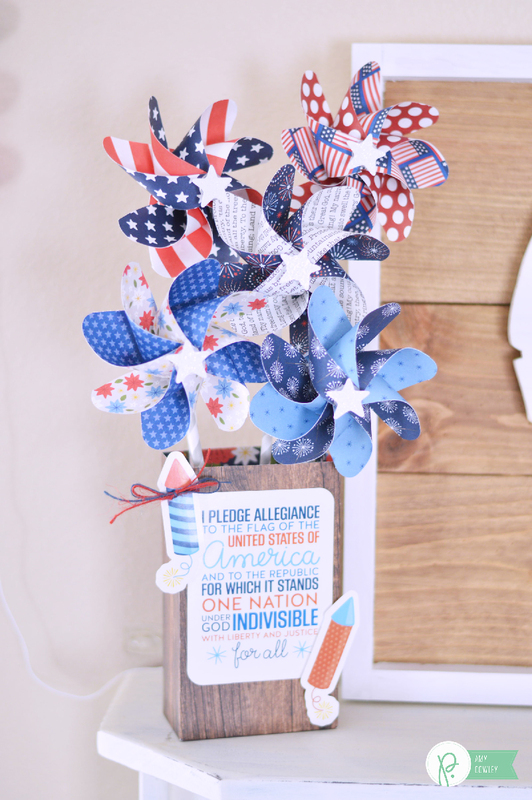 I embellished the front with the fireworks and Pledge of Allegiance from the America the Beautiful Ephemera Die-Cuts. I hot glued a piece of floral foam into the bottom of my bag, so I’d be able to stick the pinwheels down into it. Once I had my bag done, I started on the pinwheels. 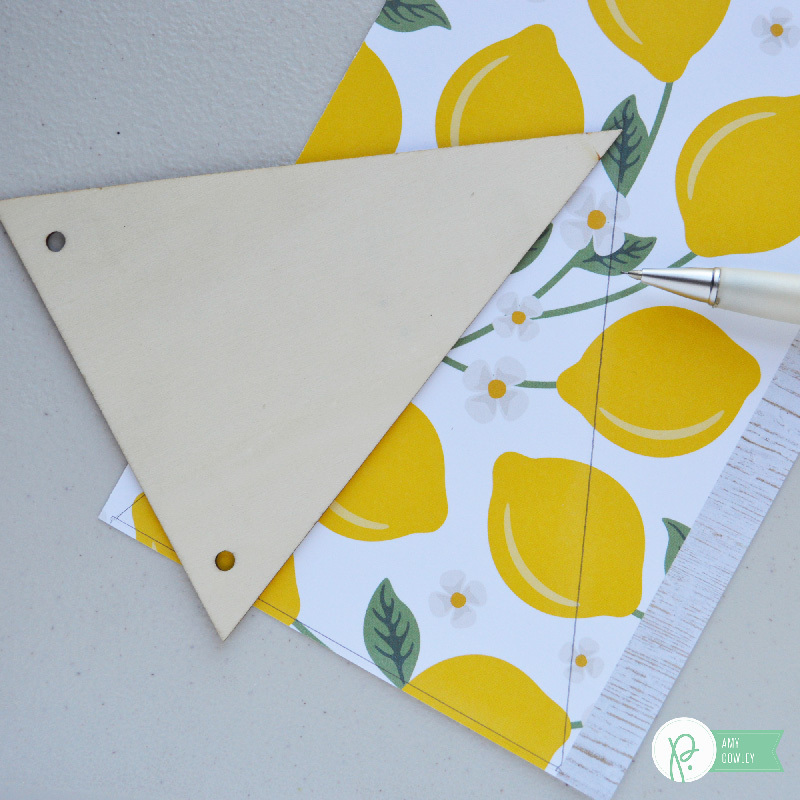 I cut my paper into 4″ squares and followed the instructions on the pinwheel punch board. I punched the corners, lined up the paper with the size I started with. 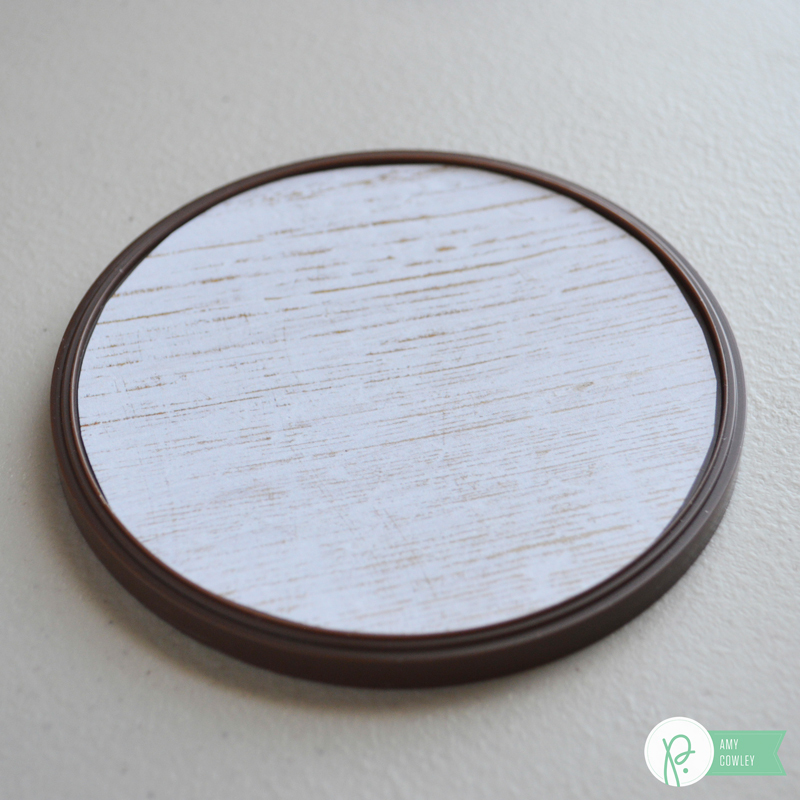 I punched the center hole and cut where it needed to be cut. 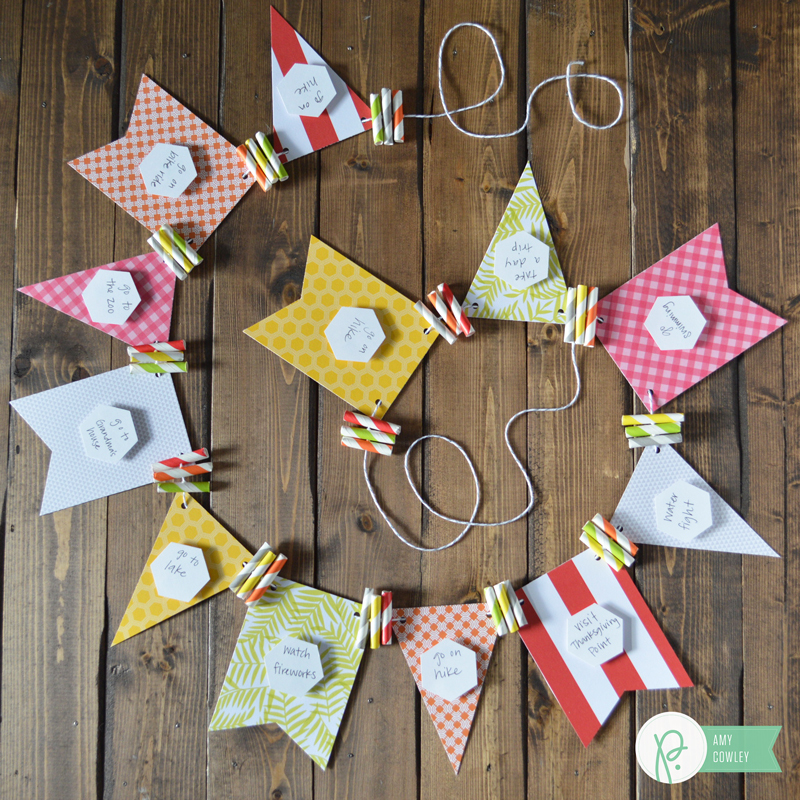 Because I was layering the pinwheels, I followed the instructions for cutting the second piece. I got all my papers cut, got my pinwheel parts out, and started assembling them. I placed the back piece of paper on the back, and layered the front piece at a diagonal on the top. 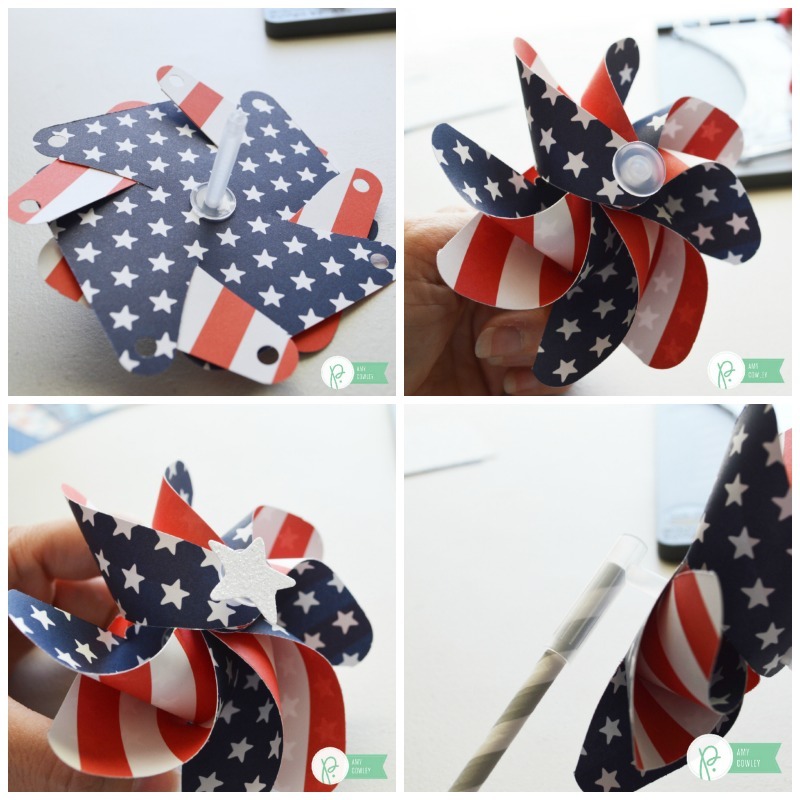 I put it on the plastic part for the pinwheel, then added the front pinwheel part. I pulled the back paper through the cuts on the front, pulled all the punched holes to the center and put them on the dowel piece. 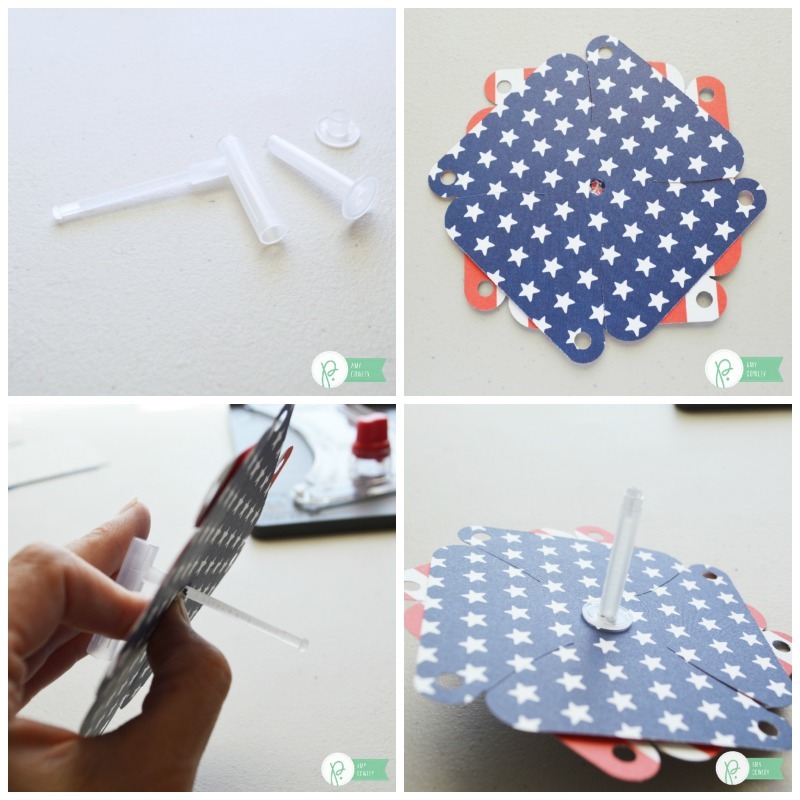 I place the front cap on, added a star sticker, and put the paper straw in the back. 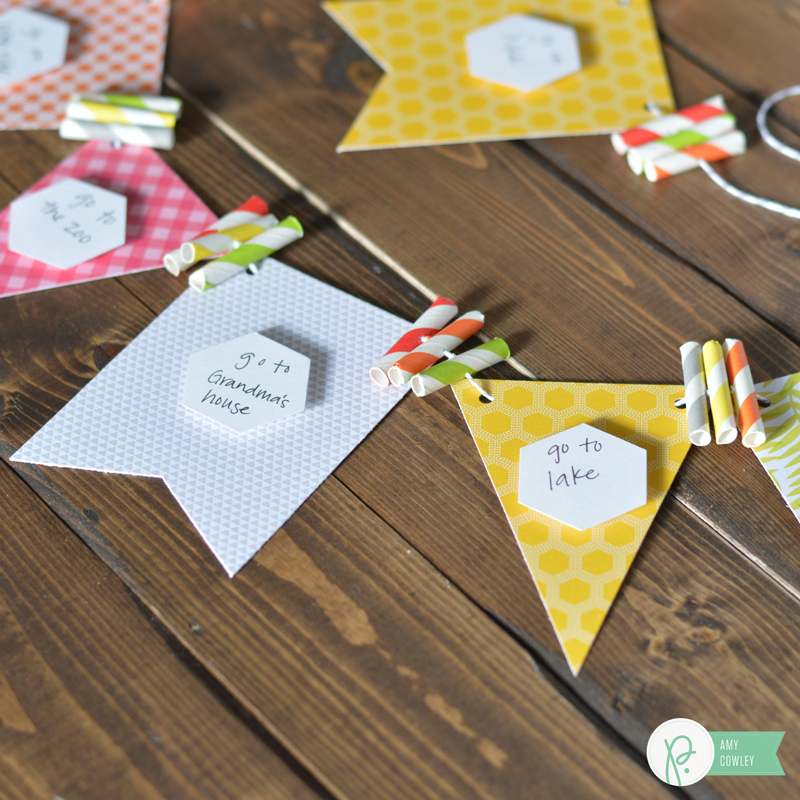 Once I got all of my pinwheels made, I put them in my bag. I had the perfect spot for it up on my shelf next to the rest of my Independence Day decor. 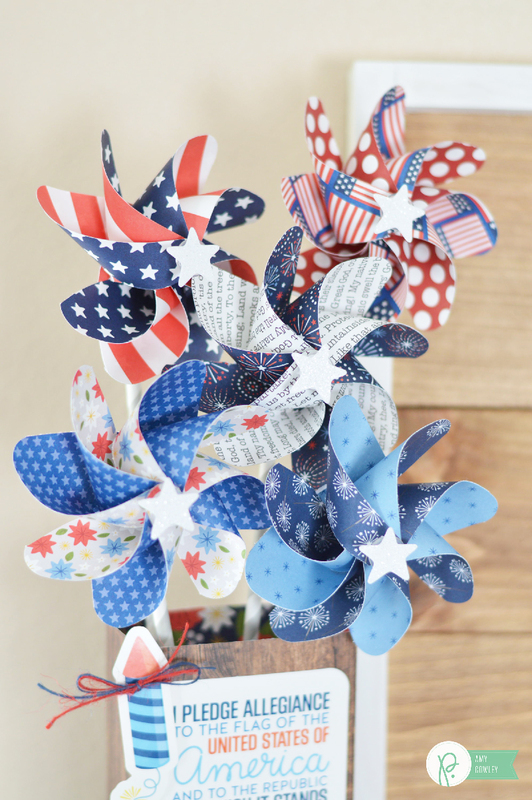 I love the way the pinwheels look all done up! They are SO fun! 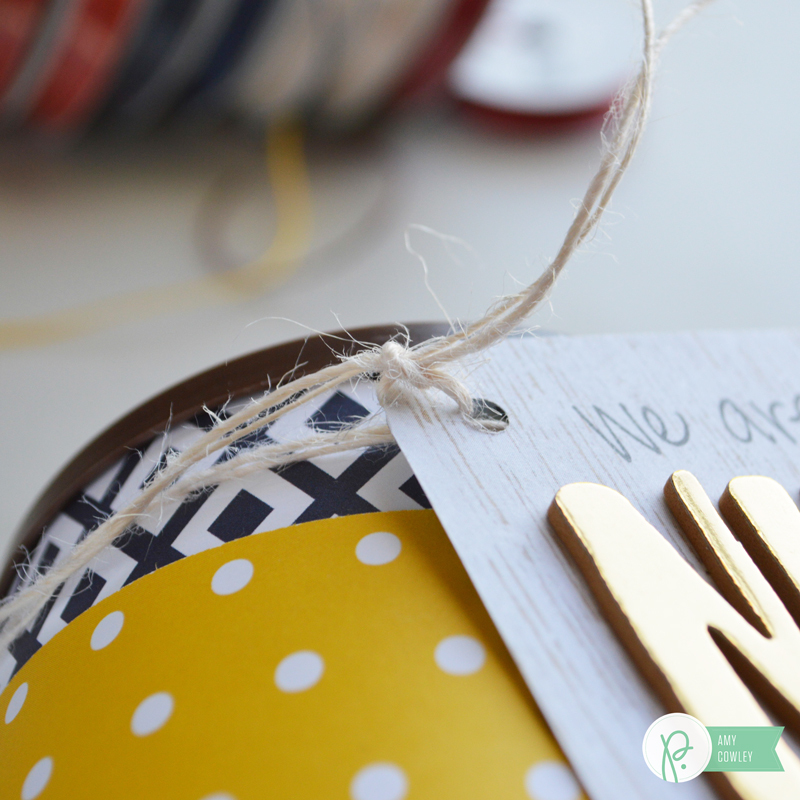 Even though the bag was really simple to make and put together, as well as add the embellishments to it, I love the way it turned out. 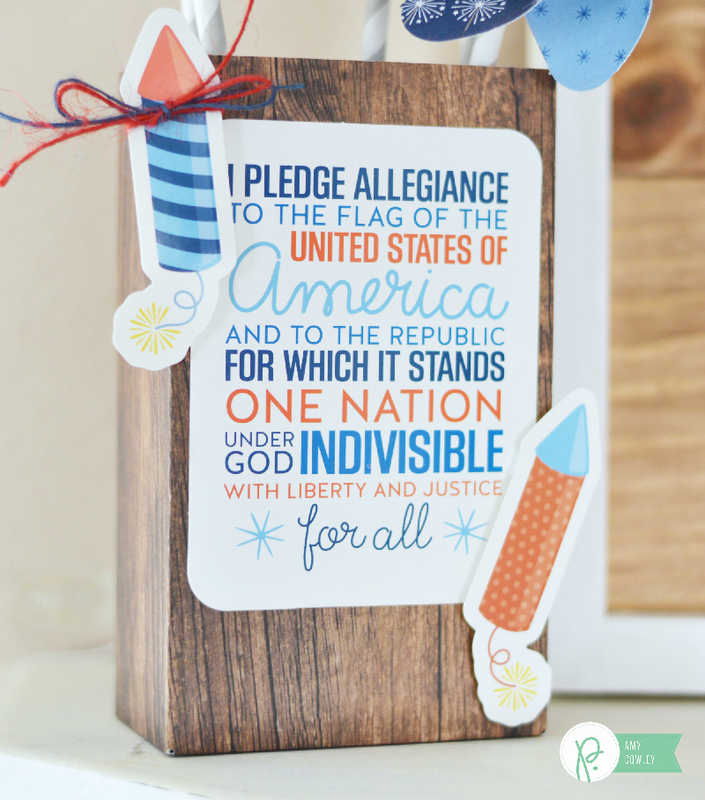 I was excited when I found the Pledge of Allegiance in the pack. 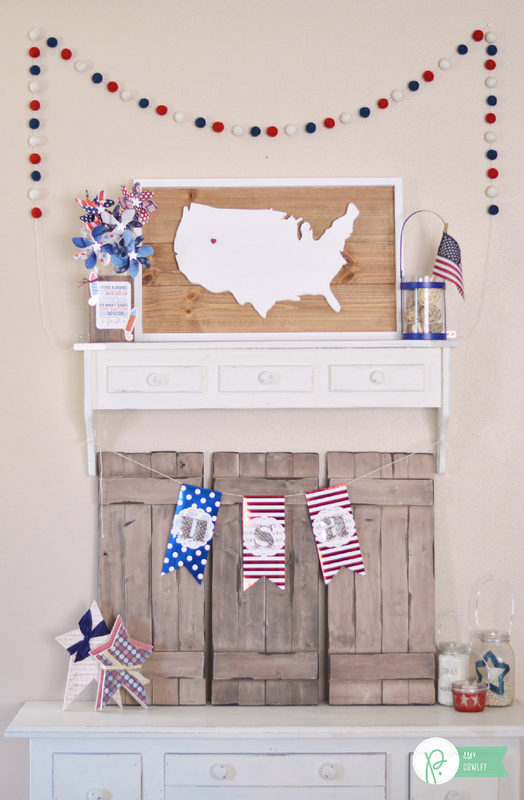 I love what it adds to the rest of my 4th of July decor. Hey there, Amy from The Happy Scraps here today. 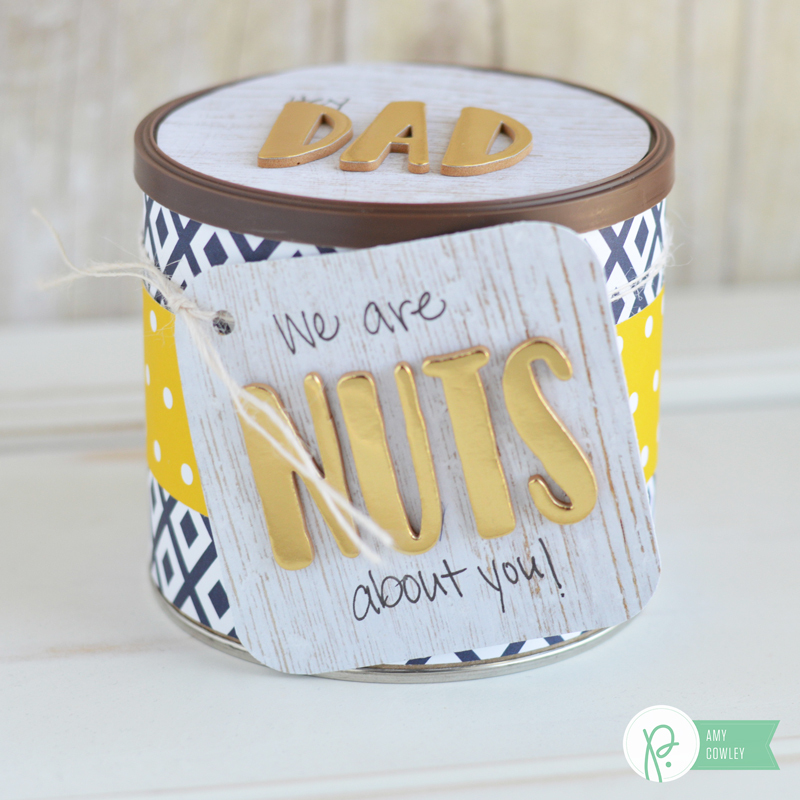 I don’t know about you, but when it comes to gifts for Father’s Day, I always have a hard time coming up with something useful that I think they’ll like. I figure that they can always use snacks, they can take them to work, snack on them on their commute, or just snack on them at home. 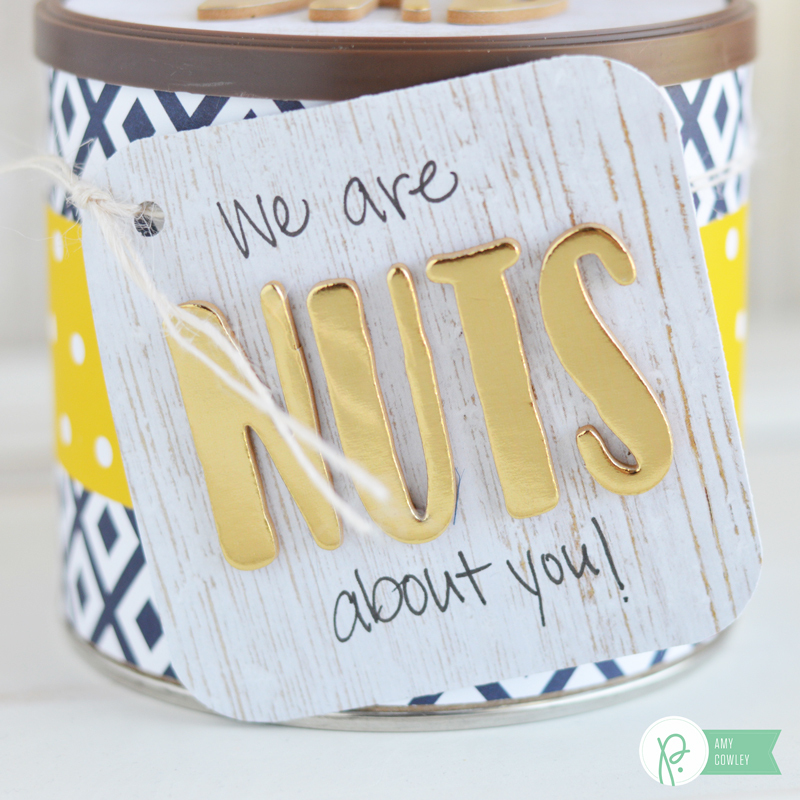 So, I decided to grab a can of peanuts, and use a play on words to put this quick gift together. 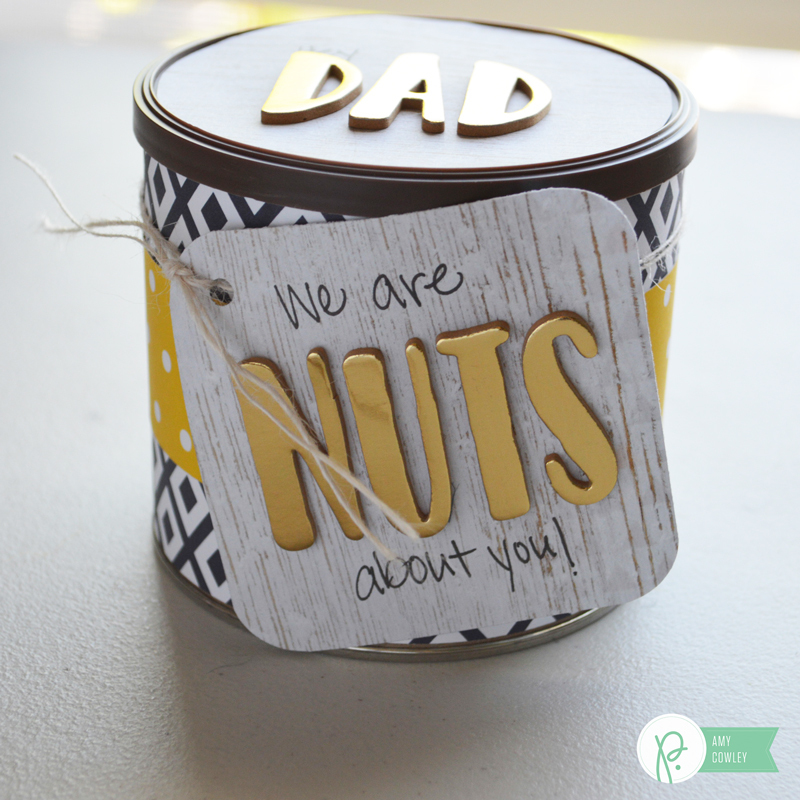 You can have this Father’s Day Quick Gift made in about 10 minutes, and Dad is sure to love it. 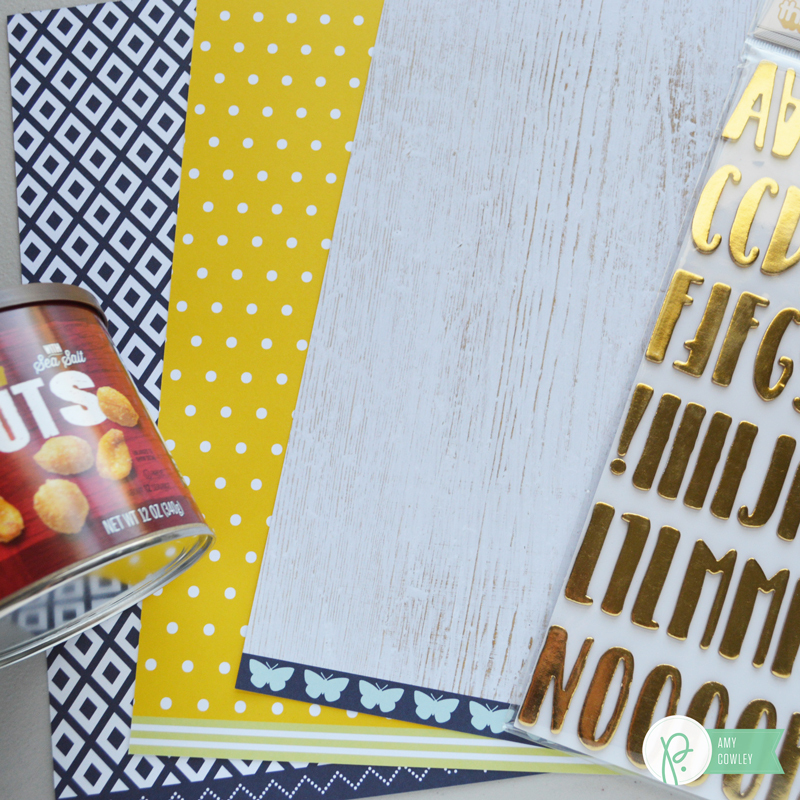 I grabbed some paper from the Jen Hadfield Everyday Collection and the Gold Foam Thickers from the Spring Fling Collection and of course the can of nuts. 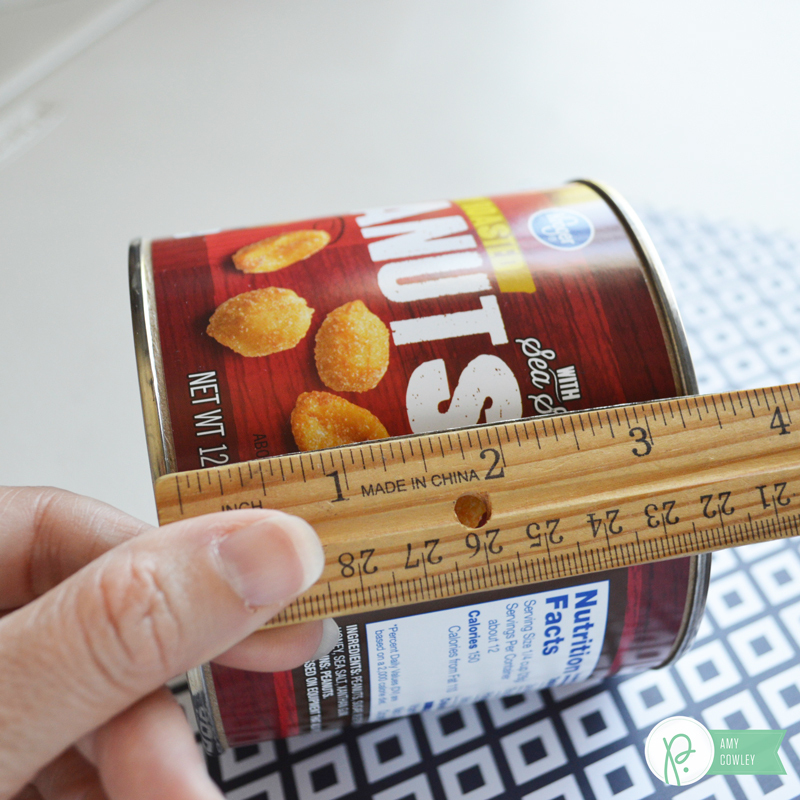 I started by measuring the can so I would know how big to cut my piece of paper. 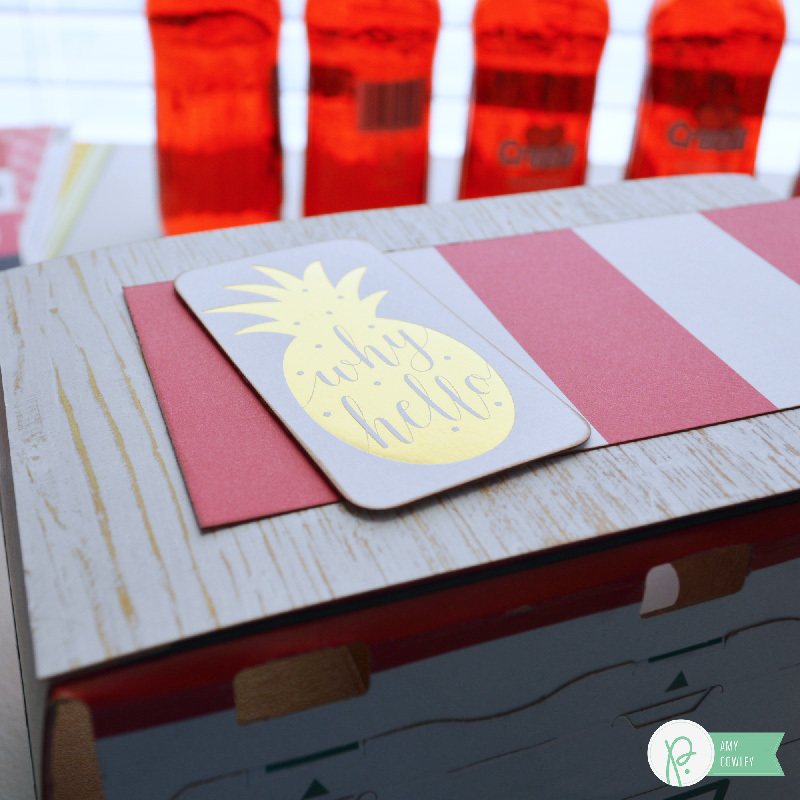 I wrapped the can with Jen Hadfield Everyday Anchored with Jen Hadfield Everyday Pineapples for the smaller strip. 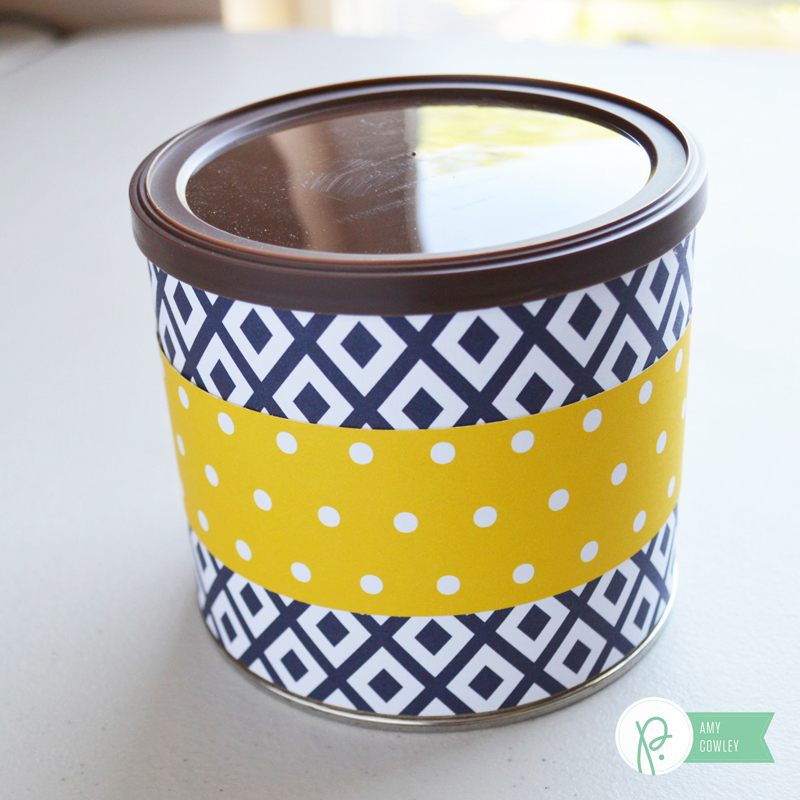 I traced the lid onto the Jen Hadfield Everyday Pops of Color paper and cut it out. 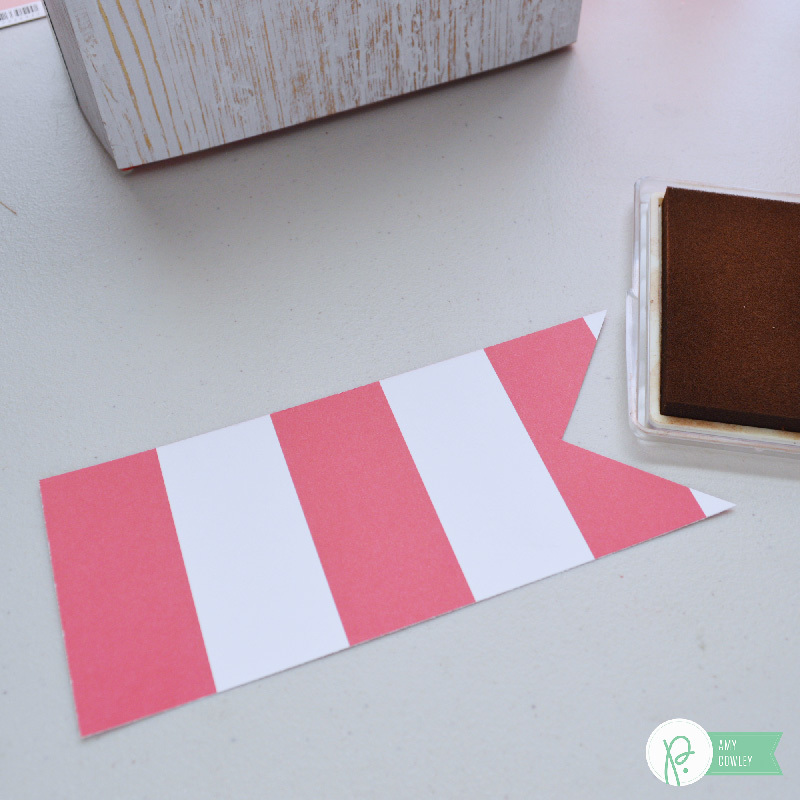 To get the paper to fit inside the little lip on the lid, you’ll want to cut just inside the line. 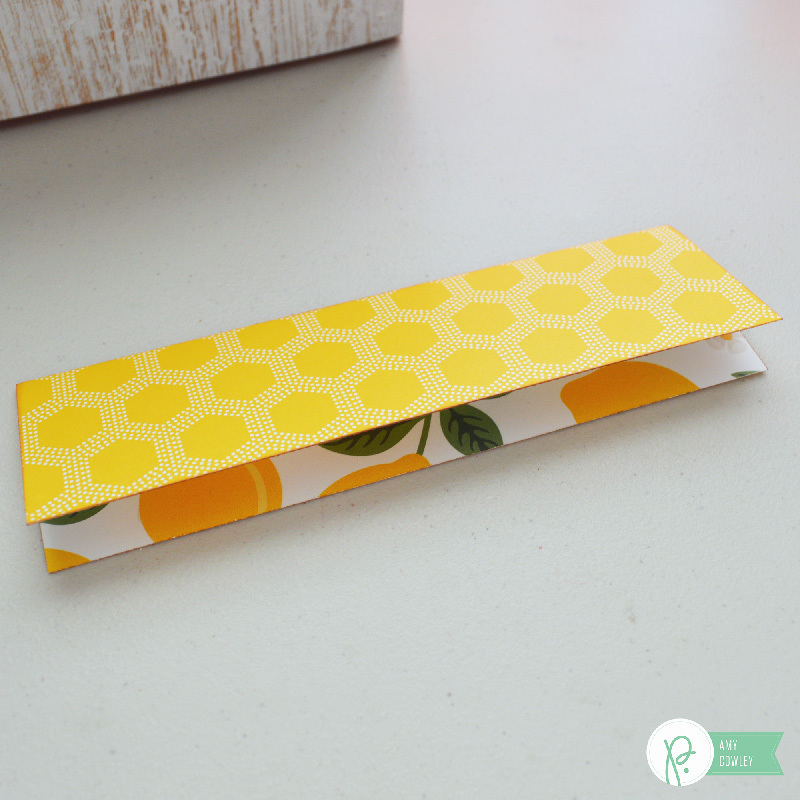 Make sure your paper fits inside the lip on the lid, but don’t adhere it just yet. 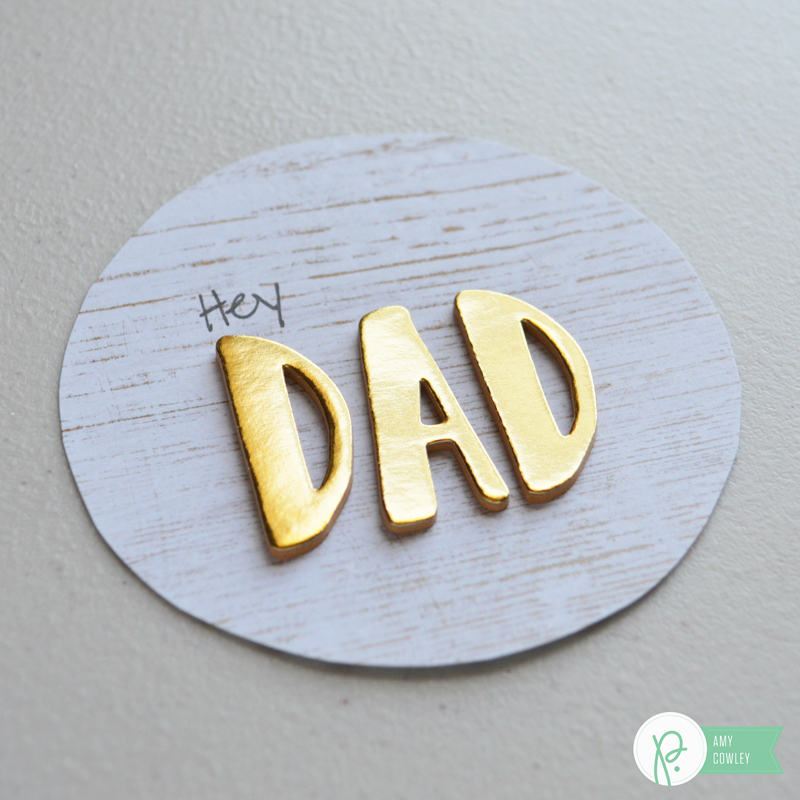 Take your paper back out of the lid and add the gold foiled foam thickers spelling dad. Then hand write the word hey above the thickers. 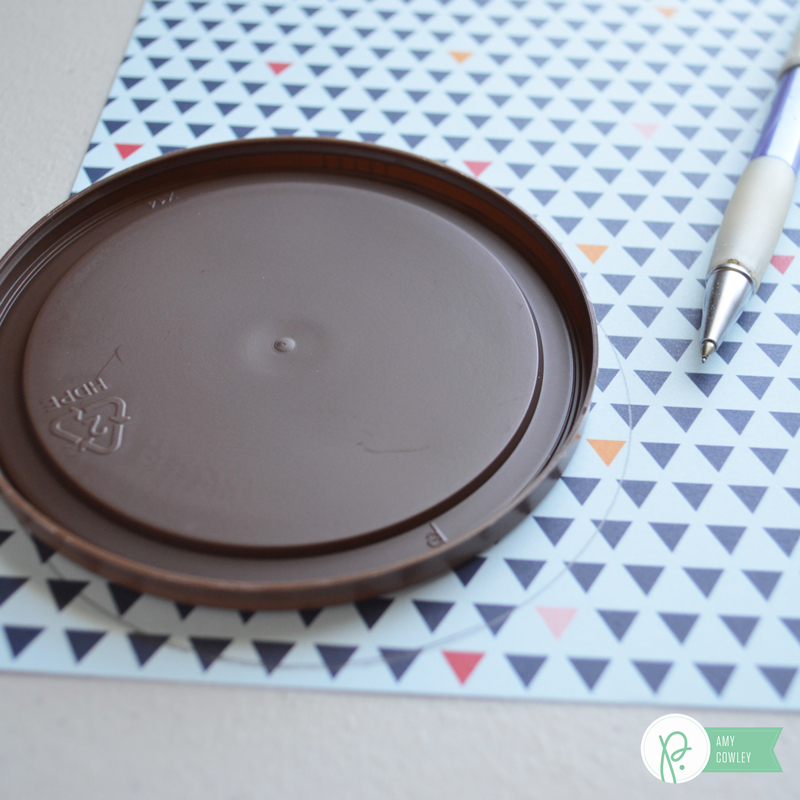 Now you can adhere the top to the lid. 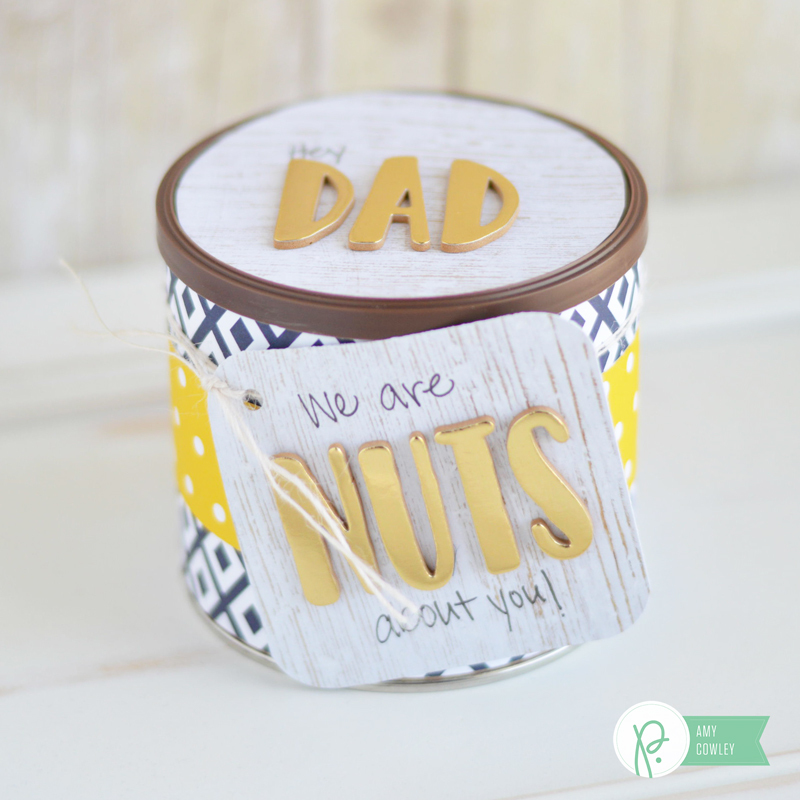 Next, I spelled the word nuts onto the Jen Hadfield Everyday Pops of Color paper, leaving room to write above and below it. 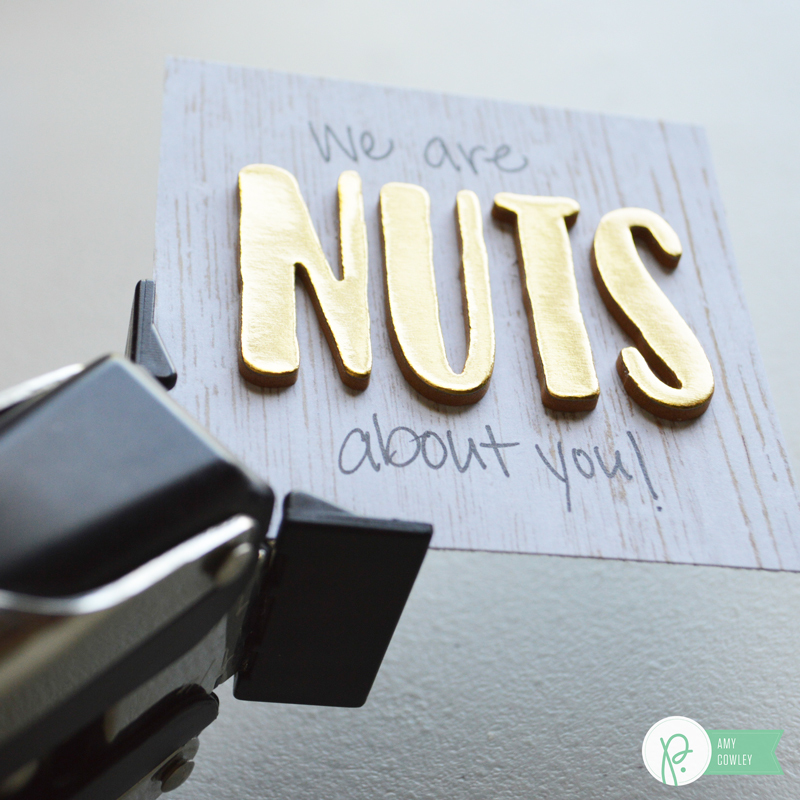 Then I used my paper cutter to cut a square out around the word. Once I had it cut out, I hand wrote “we are” and “about you!” on it. 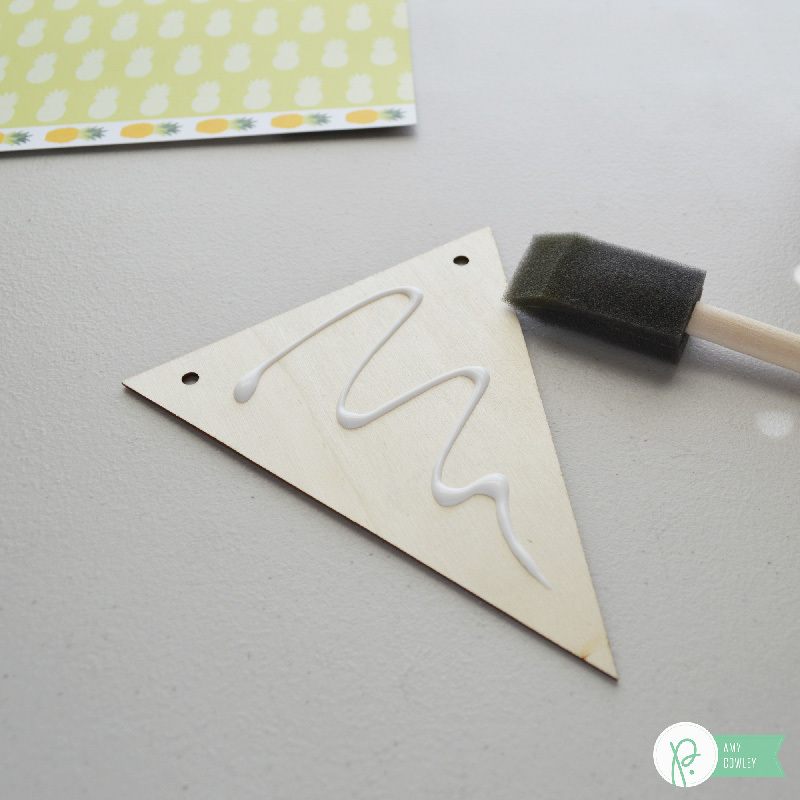 I grabbed my corner chomper and rounded the edges. Then I punched a hole in the top corner. 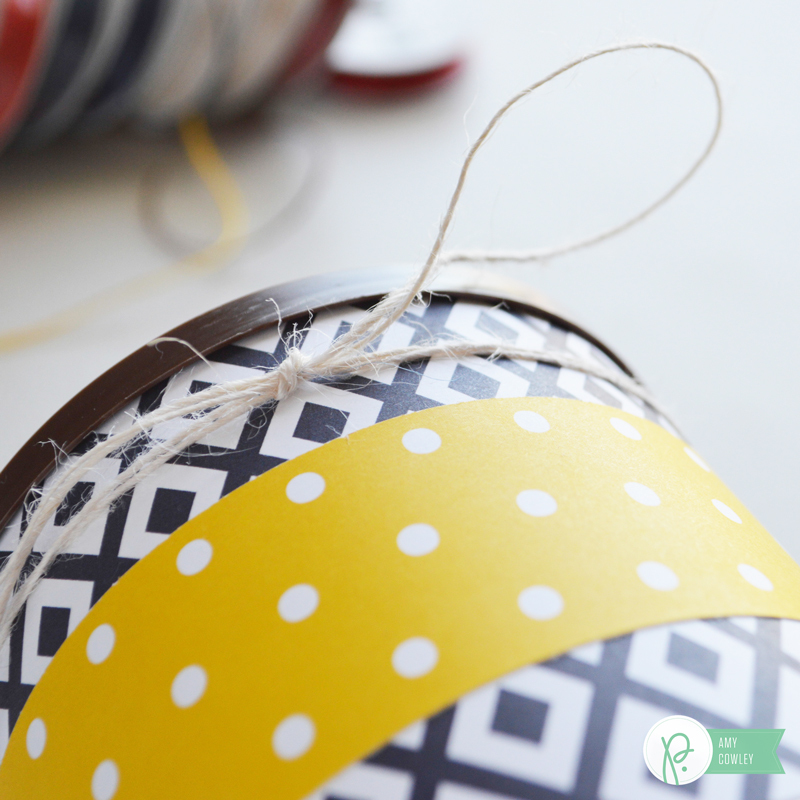 Using some twine, I doubled it up and then tied it around the can. I slipped the tag onto the twine and tied it on. 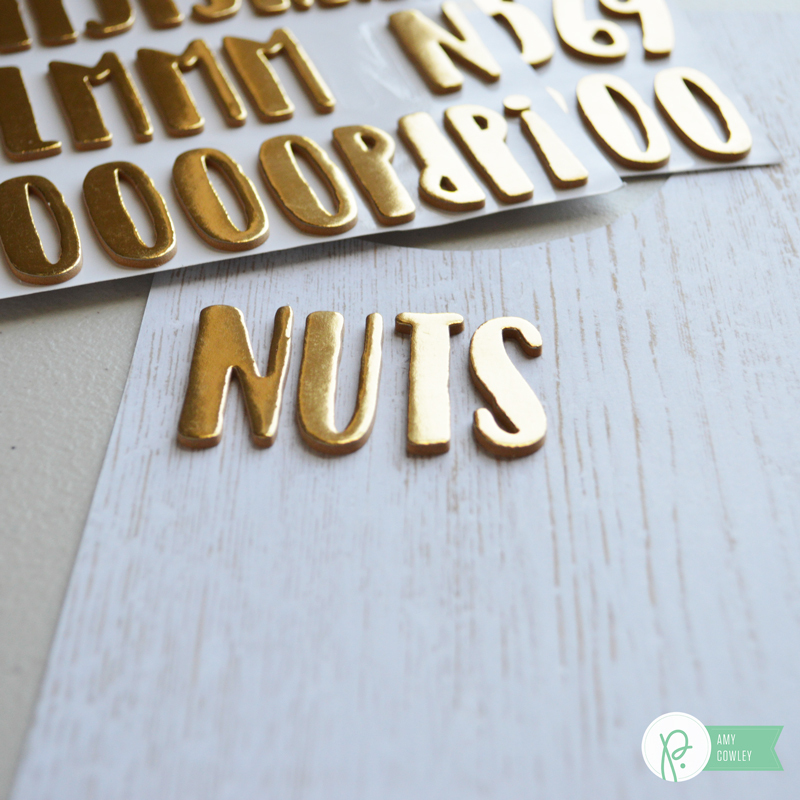 I love the way the tag turned out using the Gold Foiled Foam Thickers, don’t you? 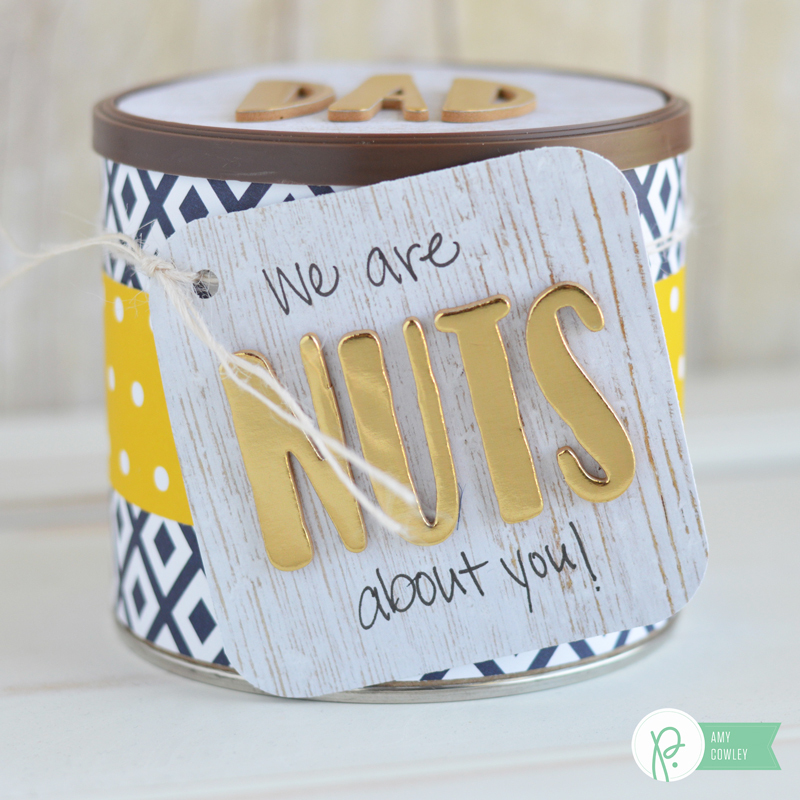 I don’t know any dad that wouldn’t love to get this as a gift for Father’s Day. Hi there. 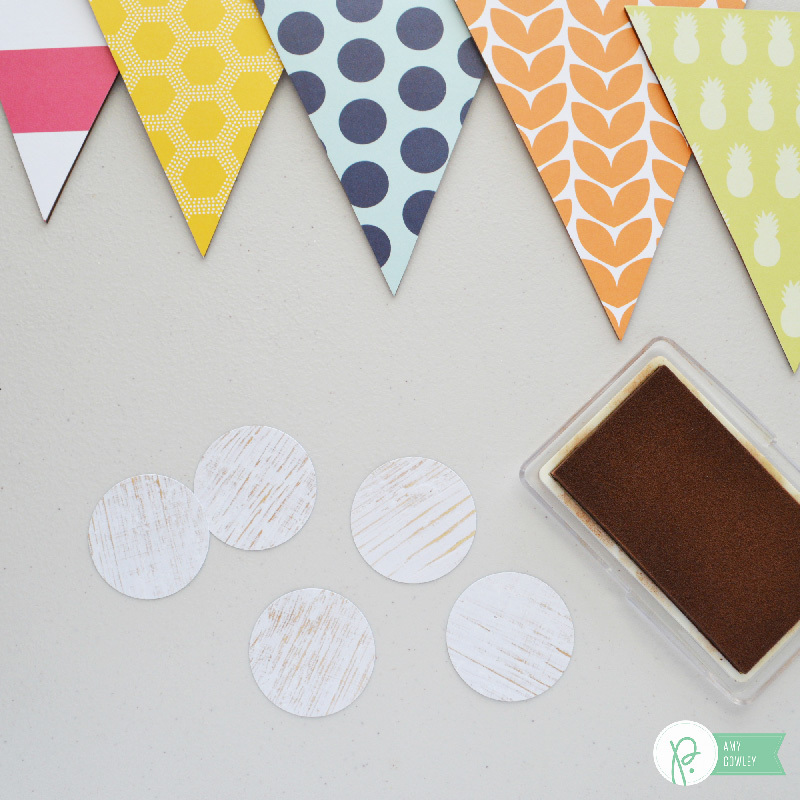 It’s Amy from The Happy Scraps here today and I’m excited to be sharing this Easy Weekend Fun Activity Banner with you. 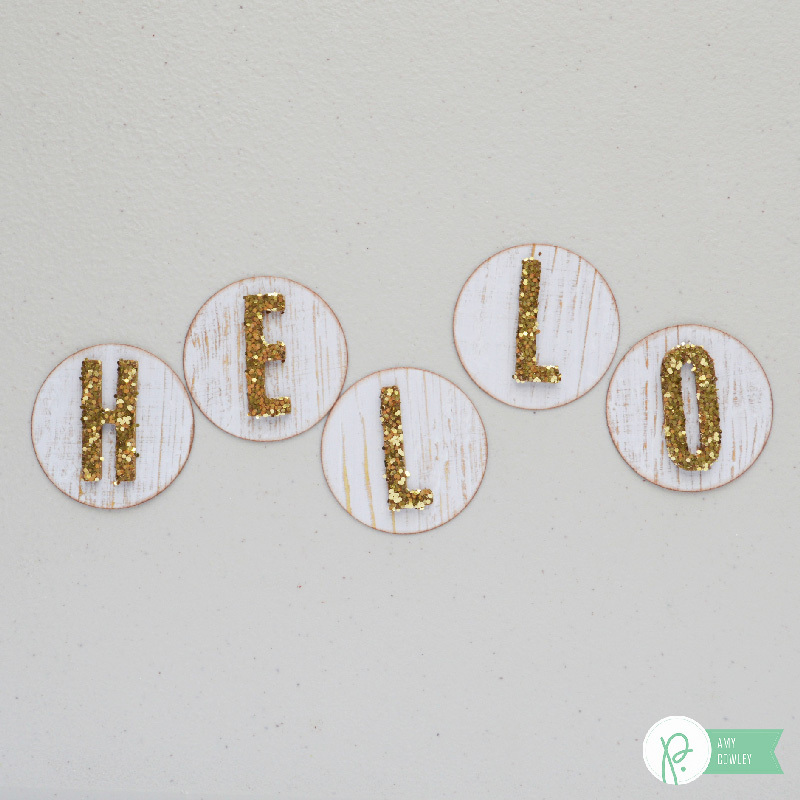 We recently moved into a new home and have been spending our weekends working on things in and around the house, getting all kinds of things done that have needed to be done since moving. 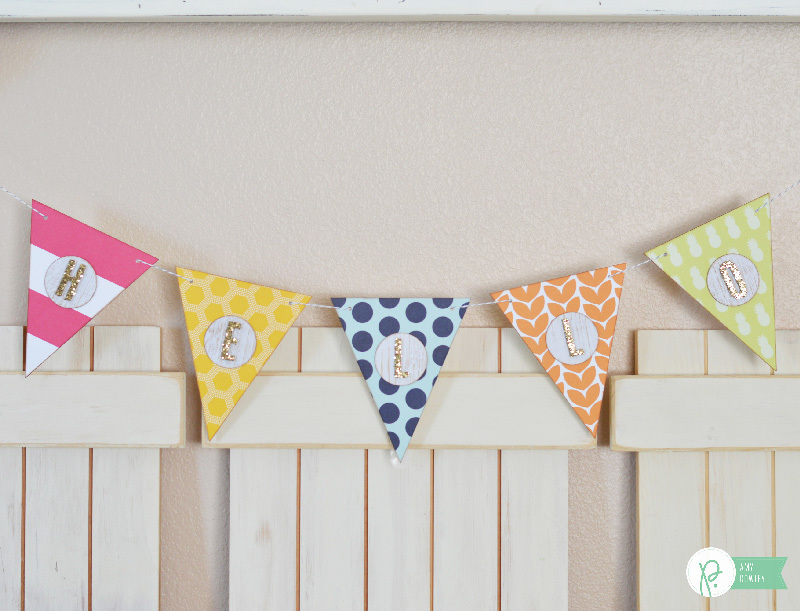 Since we haven’t done many fun things on the weekends yet this year, and since school just got out, I decided I wanted to make this easy weekend fun activity banner. I’m looking forward to the weekends this summer and getting out and spending time together as a family. 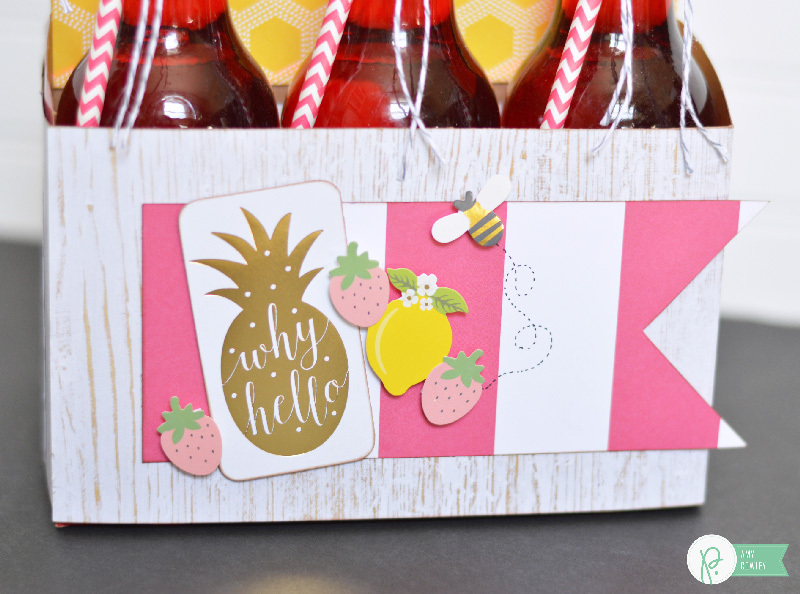 I pulled out the 6 x 6 paper pad from the Jen Hadfield Everyday collection and selected some bright and fun patterned papers that look like summer to me. 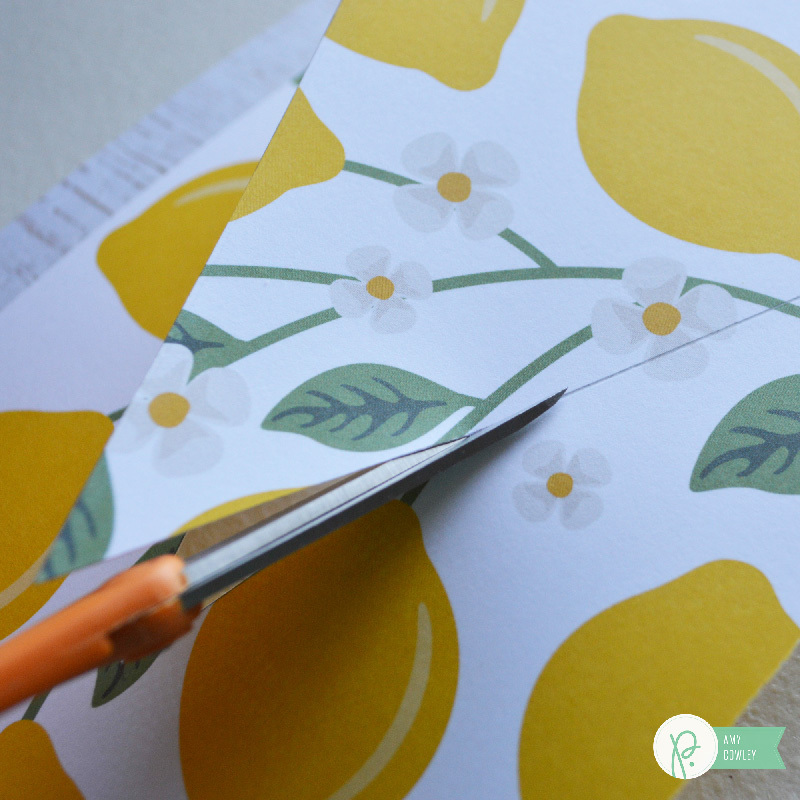 I cut them each in half so I had two pieces about 3″ x 6″. 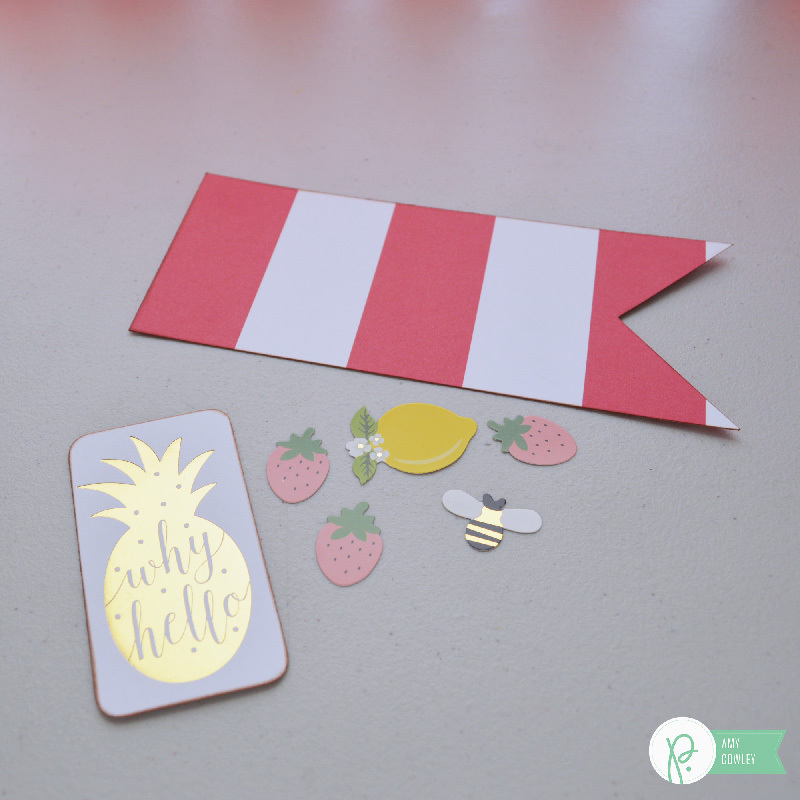 Using the Banner Punch Board and one piece of each patterned paper, I cut the flag shaped banner. Then I trimmed the top off, making them the length that I wanted. 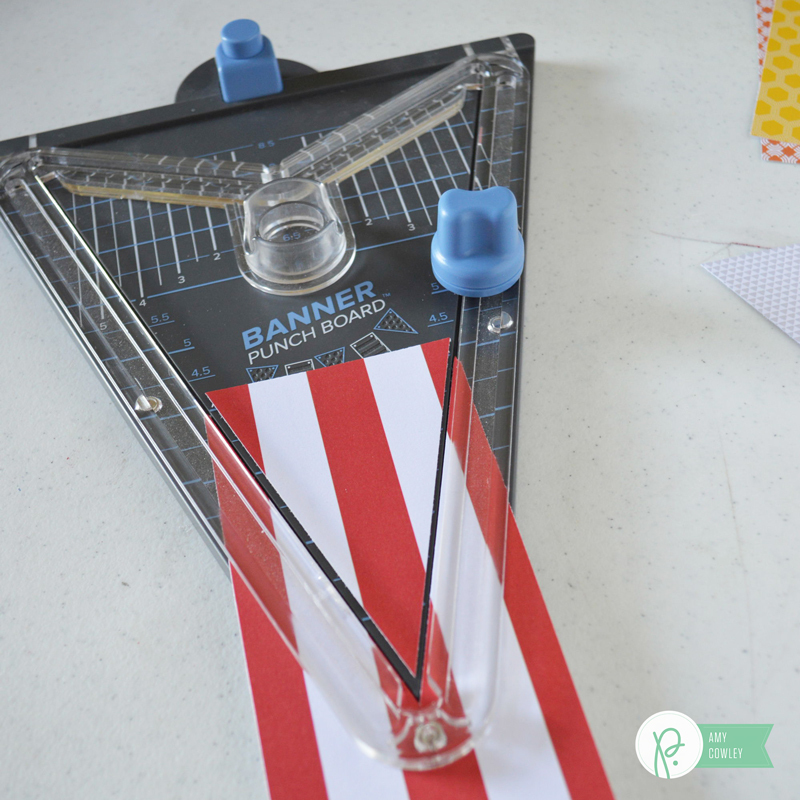 I’ve found that if I cut the top off after I’ve cut the triangle part out of the bottom, I end up with the exact size of banner piece that I want. 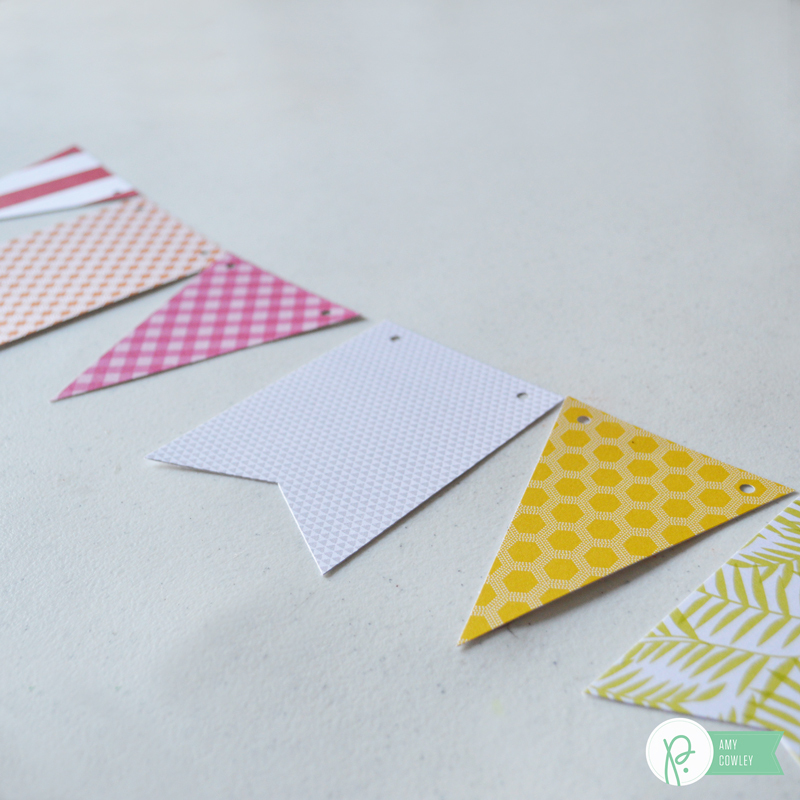 Then I cut the triangle banner pieces. Once I had all the pieces cut, I punched out the holes in the top to lace the banner together with. 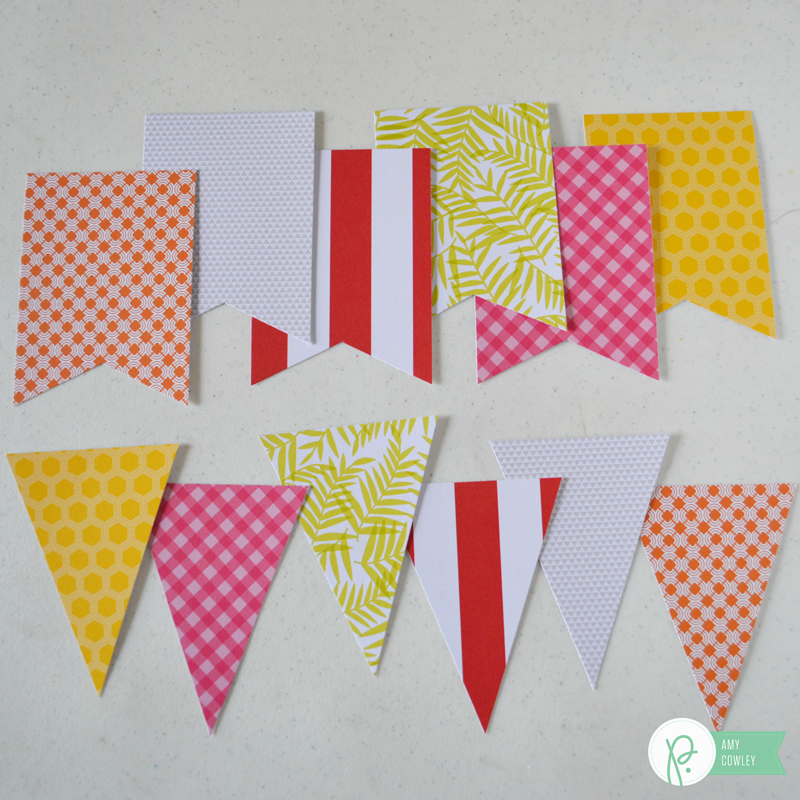 Here are all the banner pieces. 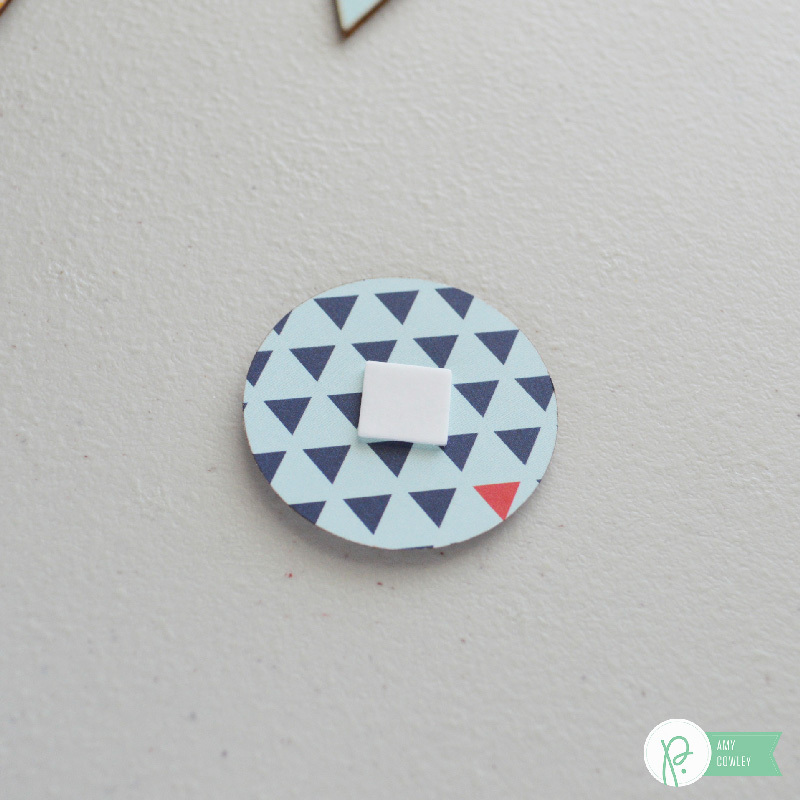 I placed all the pieces on the table, figuring out the order I wanted them to hang. 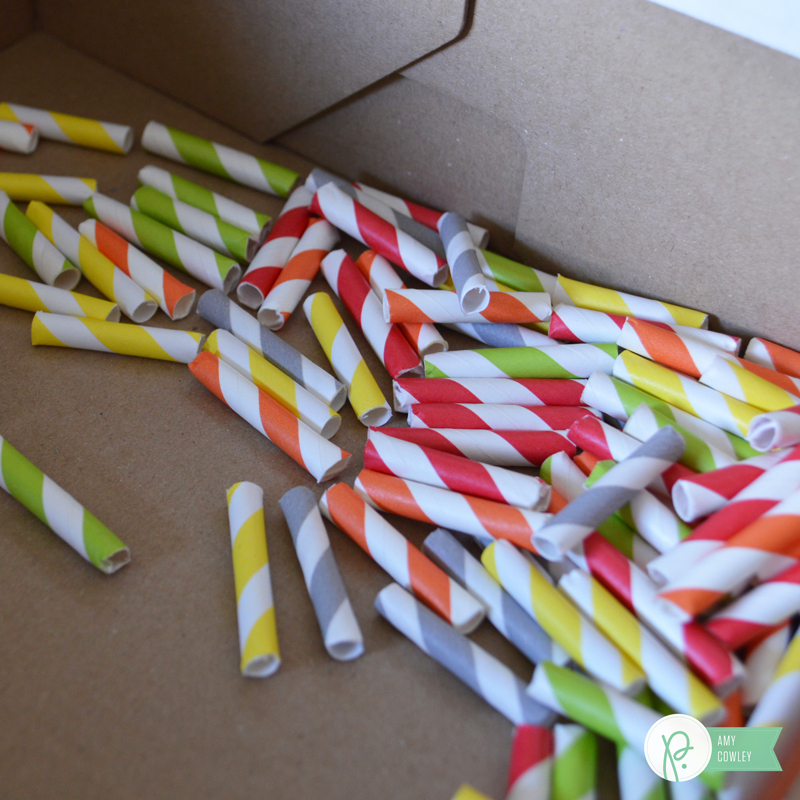 Using a large pair of scissors, I cut my paper straws into six pieces each. With a large needle, I threaded my baker’s twine into it. 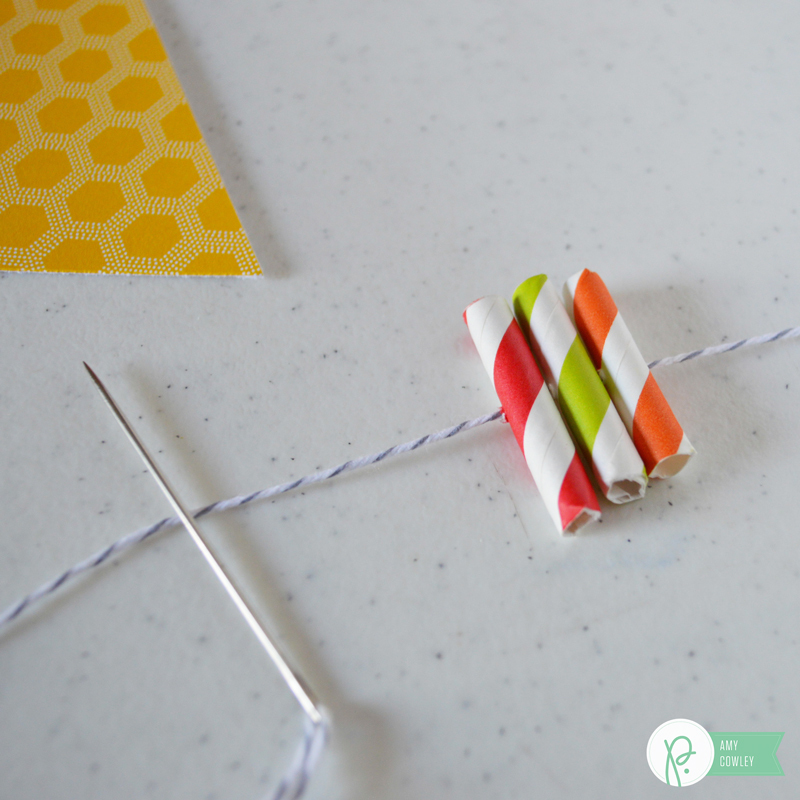 Then I put three straw pieces on my needle and pushed them down on the string. Then I added a banner piece. 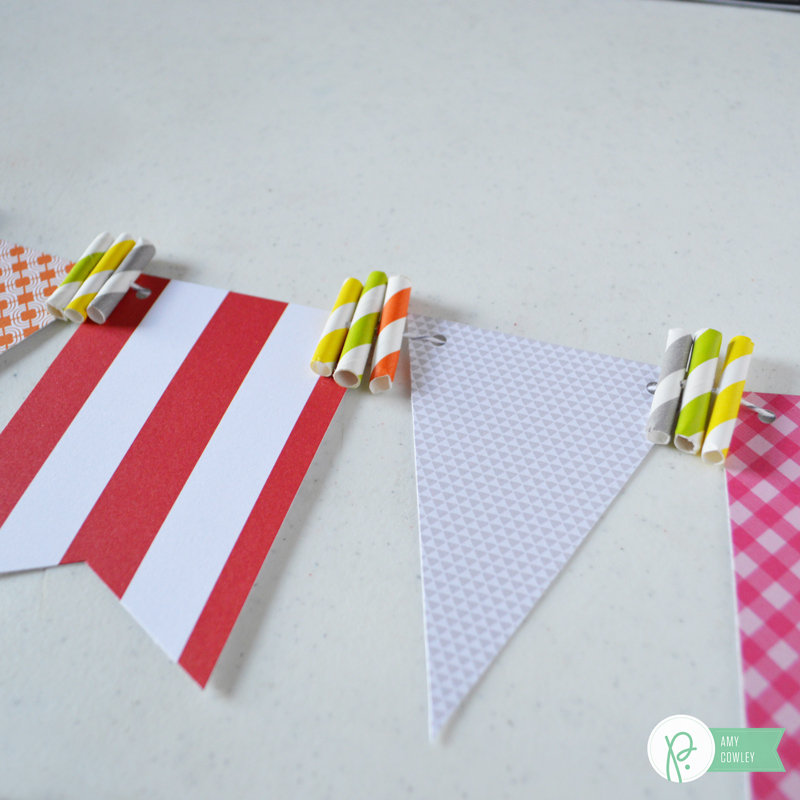 I put three straw pieces between each banner piece. 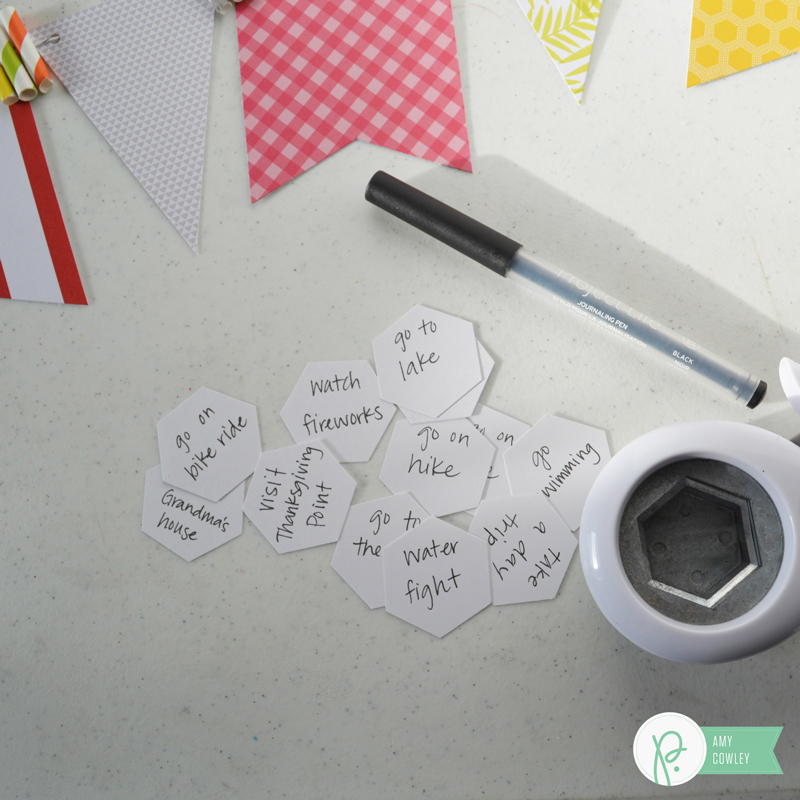 Once I had the banner strung together, I punched out some hexagon shapes and wrote our activities on them. 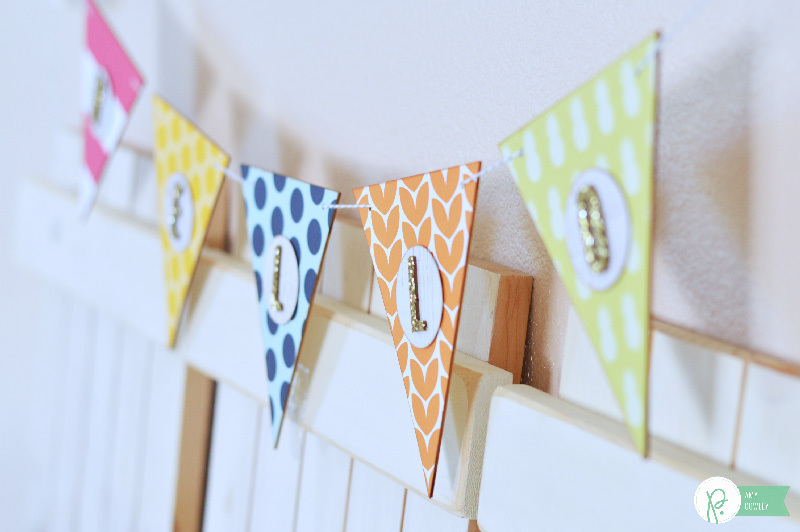 Using some dimensional adhesive squares, I mounted them onto the banner pieces. 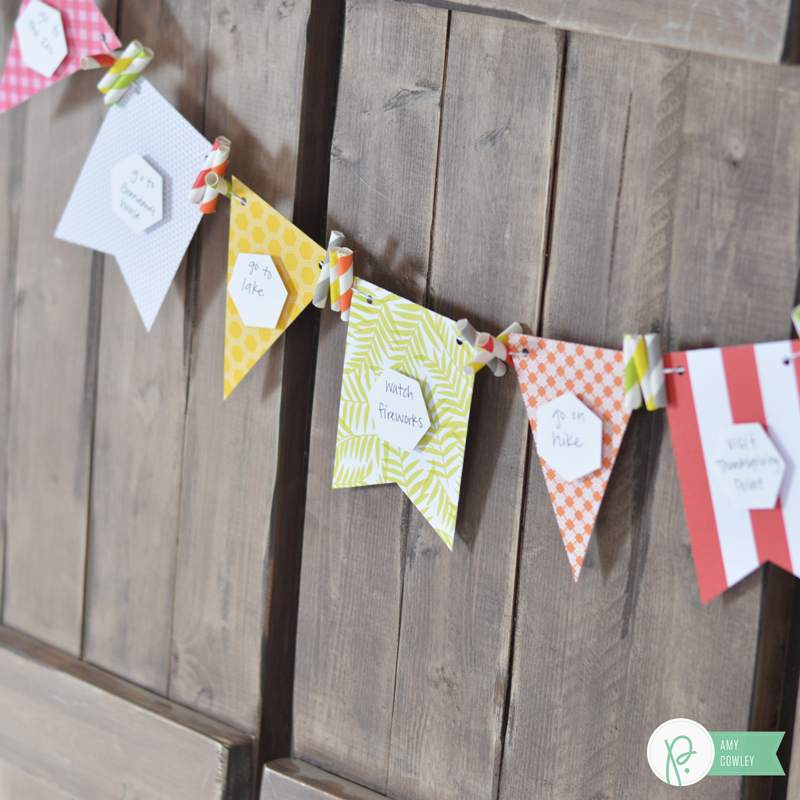 I’m so excited about these weekend activities I’ve planned to do with my family and I’m also excited that it looks so cute to hang up too! Here it is, hanging from my self. 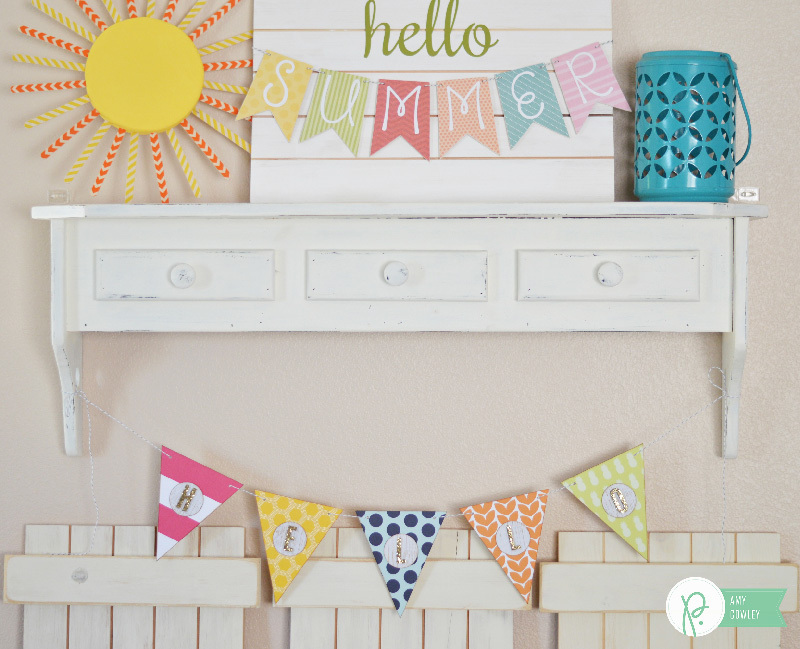 Doesn’t it just go perfectly with my Hello Summer board? 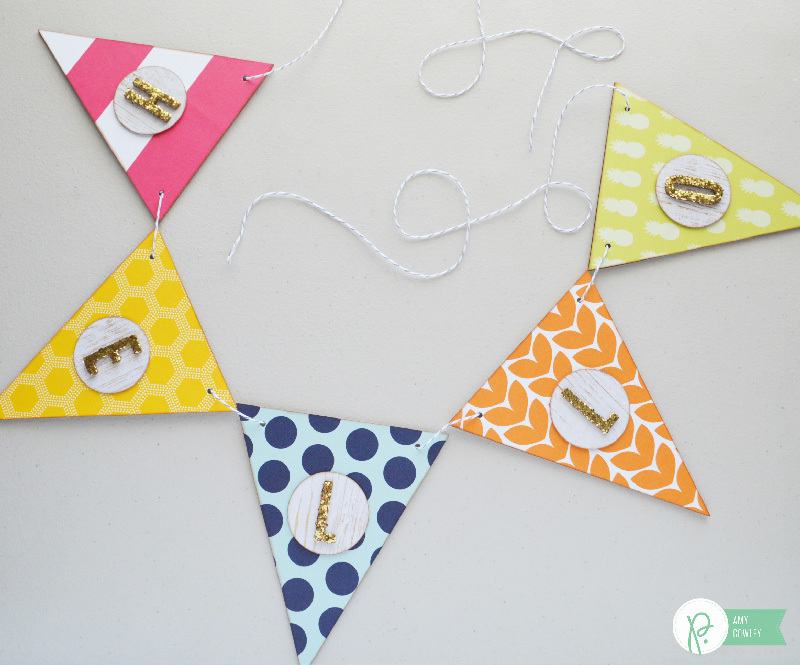 What fun plans do you have for the summer? 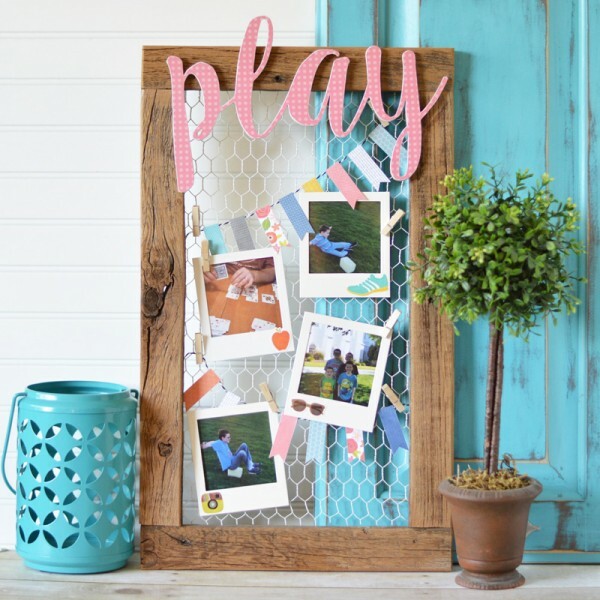 If you are looking for a fun way to display your photos from a fun weekend, check out this fun Play Frame.